6/18/07 Fabricated the four F-904L straps. 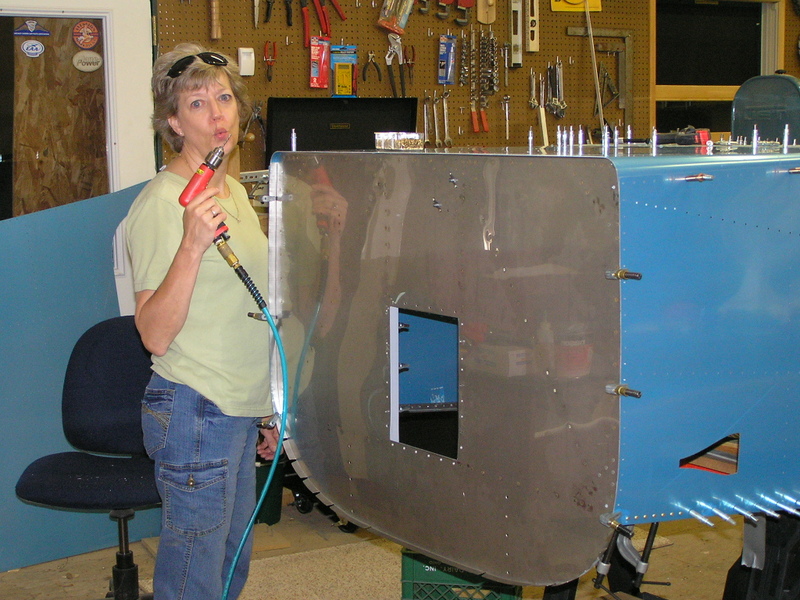 6/19/07 I got Lynne to help me drill the four F-904L straps. 6/20/07 To celebrate my birthday today I hung the firewall! I clamped the firewall to the longerons and installed the bottom skin. I drilled the bottom skin on both sides to the firewall bottom angle and clecoed. 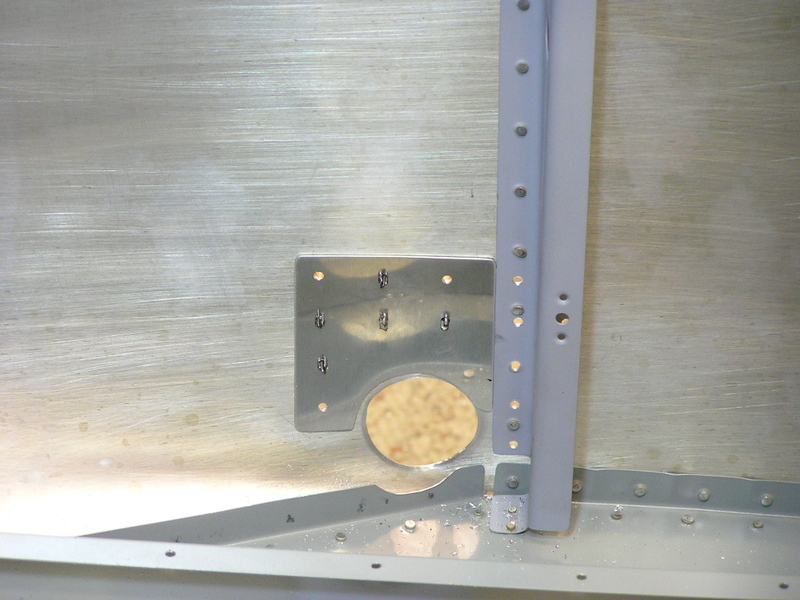 Finally, I installed the AN470-4-4 rivets in the side holes to hold the firewall in the proper place. 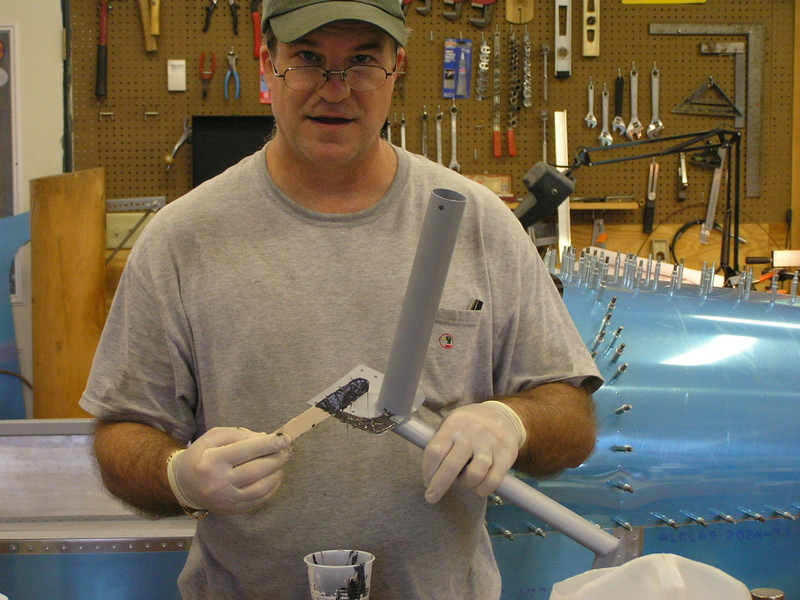 6/22/07 After verifying the face of the firewall was 5/8" aft of the forward edge of the F-970 skin, I drilled the F-970 skin to the firewall flanges. Drilled the F-970 skin, longerons and through the steel brackets. 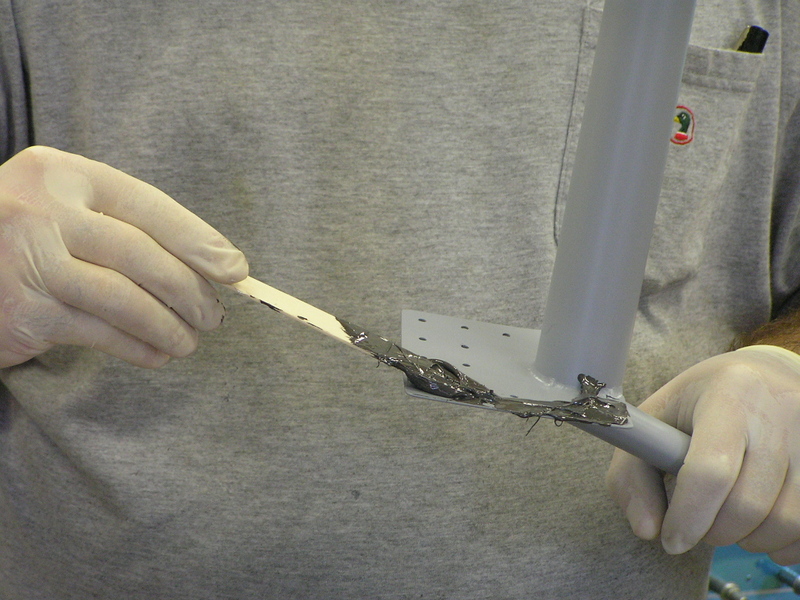 The steel has to be drilled slowly and I used lots of BoeLube on the bit. 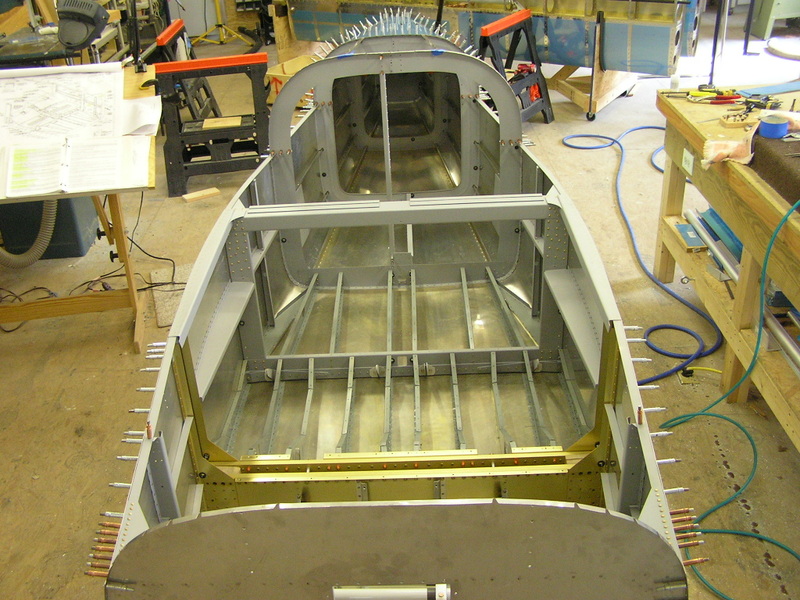 Removed the F-972 lower skin and traced the pattern for the landing gear sockets and brake lines. After drilling with a 1/2" bit I cleaned up the gear holes with the Dremel. I drilled the brake line holes to full size with a step-drill to 5/8". 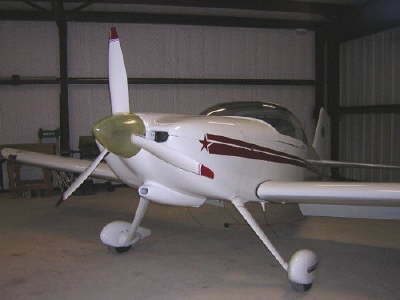 6/23/07 Installed the F-713 auxiliary longerons. 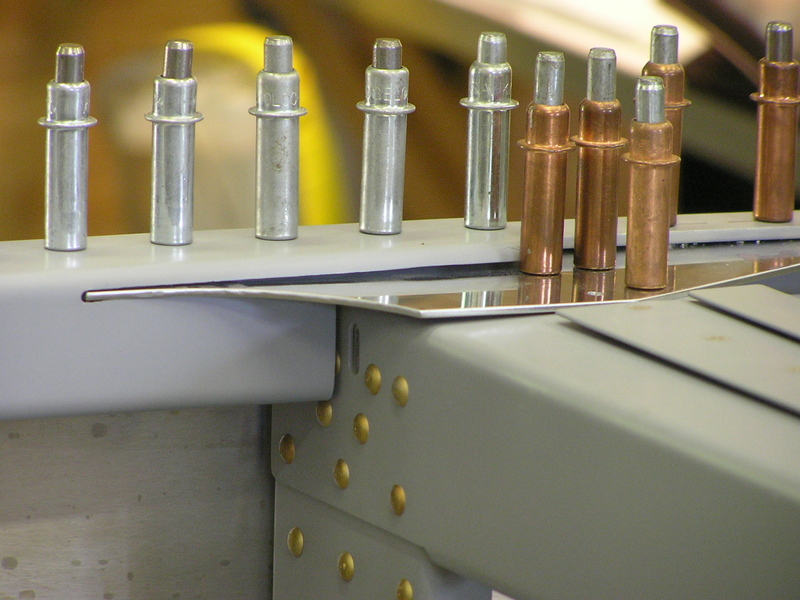 I drew a centerline on each longeron and also clamped in the vise and twisted each one in order to let it fit right. Drilled the auxiliary longerons and clecoed. Made the F-719B angle clips and drilled them to the F-719 R&L forward skin stiffeners. Made the F-917 R&L lower longerons by cutting to length and then trimming them according to the plans. These also had to be clamped and twisted slightly. 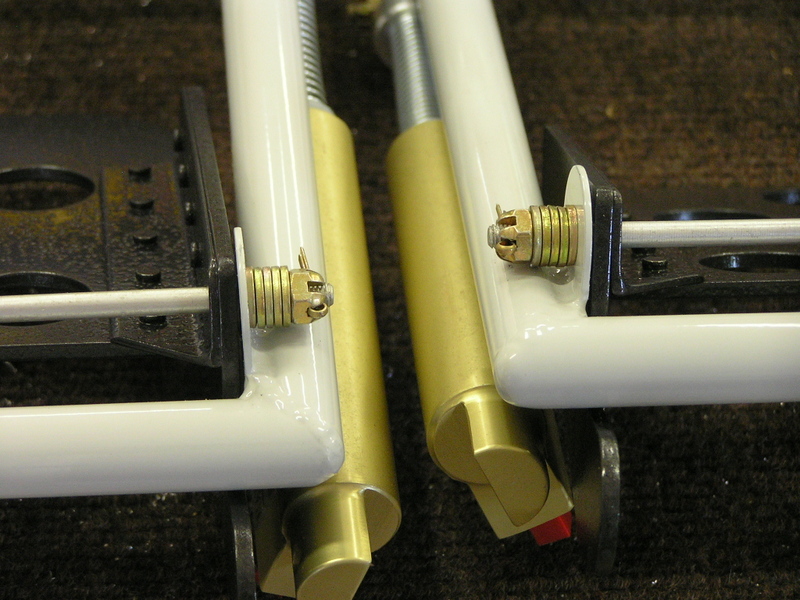 I clamped each one to the WD-603 and drilled for the AN-3 bolts. I spent a great deal of time fabricating the F-684 gussets. Several builders have described how these things are easy to screw up. 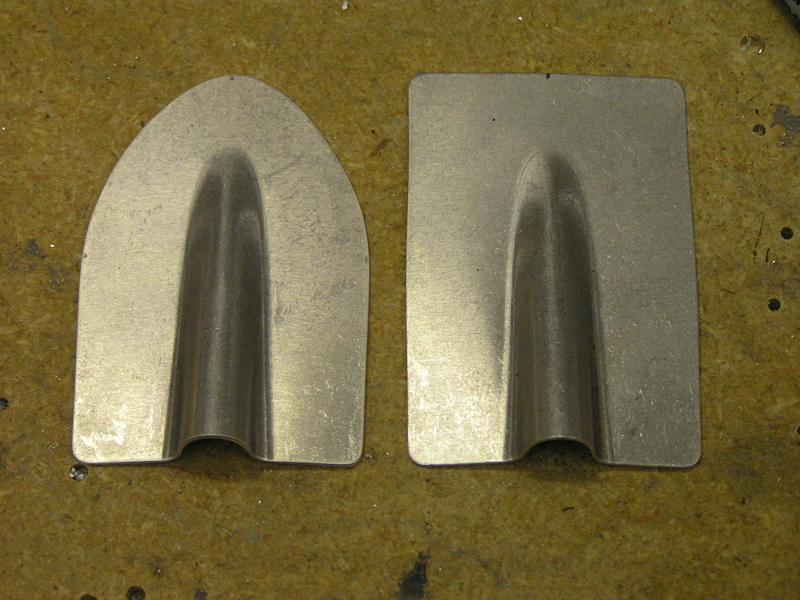 After measuring, marking, cutting, trimming, drilling, deburring and bending, I started fitting. After a little tweaking I was satisfied with the fit. I was crossing my fingers that after I drilled I would have sufficient edge distance. I had to peel back the front of the side skins in order to drill the gussets to the firewall angle but it worked out fine. Yep, looks good. 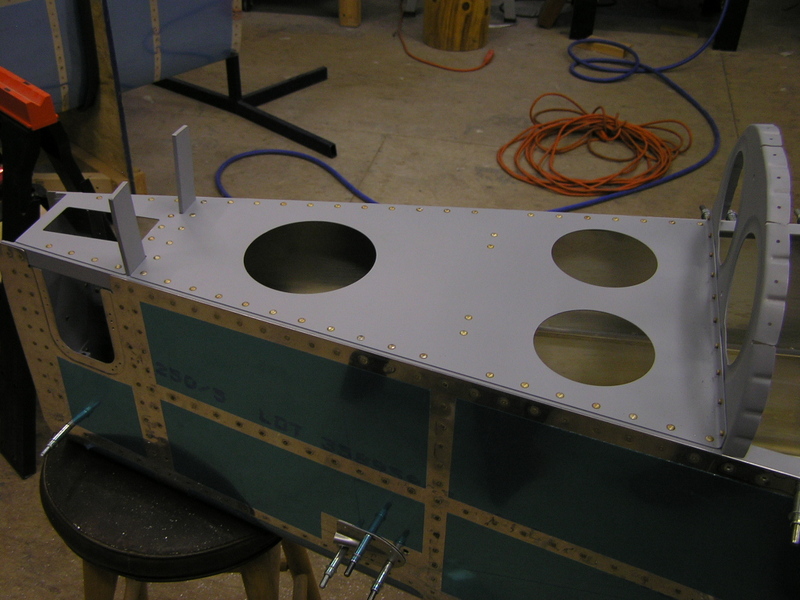 I fluted the flanges on the F-902 L&R bulkheads and opened the hole for the rudder cable to 5/8" with the step-drill. I riveted the nutplates and clecoed in place. Clecoed the F-9101 gear attach web to the F-904 bulkhead. Drilled the web and clecoed. 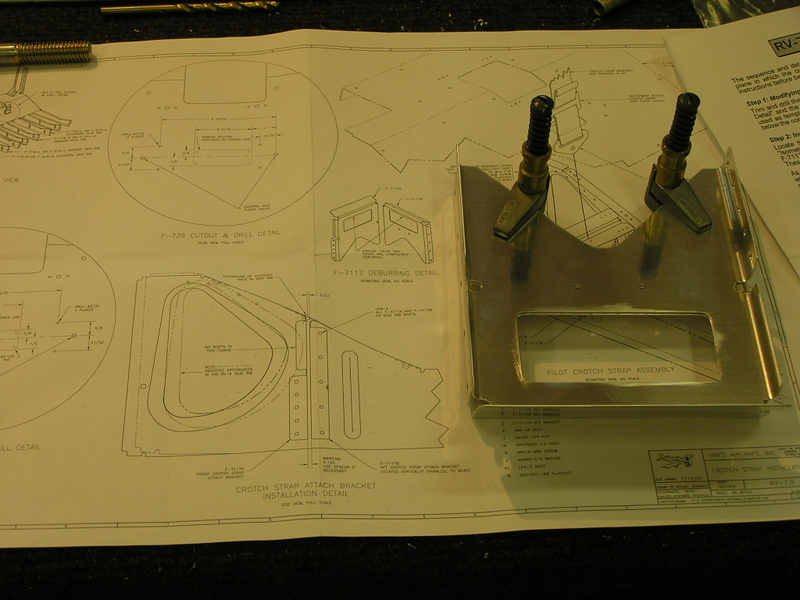 6/30/07 After checking a couple of builders' websites and talking with Mike Behnke, I decided to re-make the F-996C reinforcement angles but this time I decided to make them about 1/4" longer than the plans describe. I then test-fitted and ground them down a little at a time until I was satisfied with the fit. Next, I drilled the holes in the angle to #30 and clecoed to the F-9101 gear attach web. Match drilled and disassembled. I clecoed the F-996B spacers and test-fitted but had to grind them a little in order for them to fit between the lower longeron and the auxiliary longerons. Finally, I got a good fit so I disassembled, countersunk and deburred the F-9101 gear attach web, F-906B spacers and the F-906C reinforcement angles. I then scuff-washed, alumi-prepped and alodined. 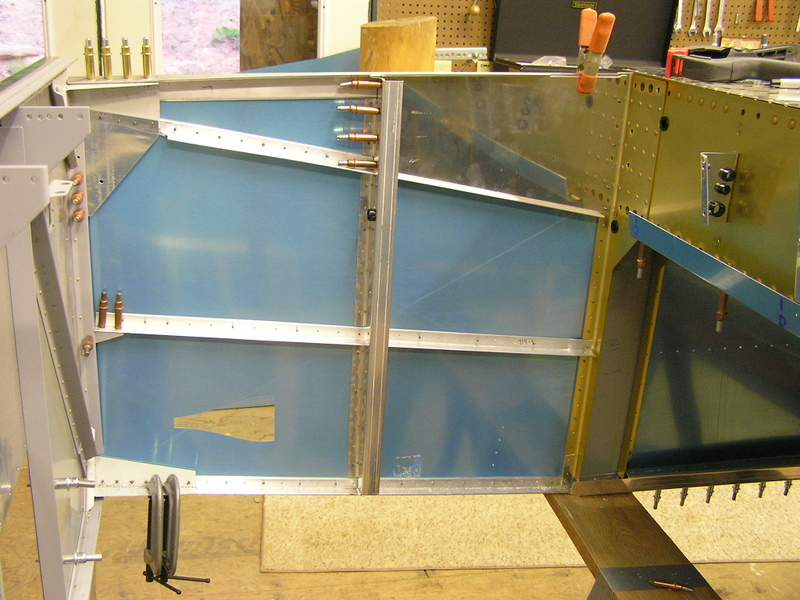 7/2/07 Riveted the F-9101 gear attach web, F-906B spacers and the F-906C reinforcement angles and clecoed to the fuselage. 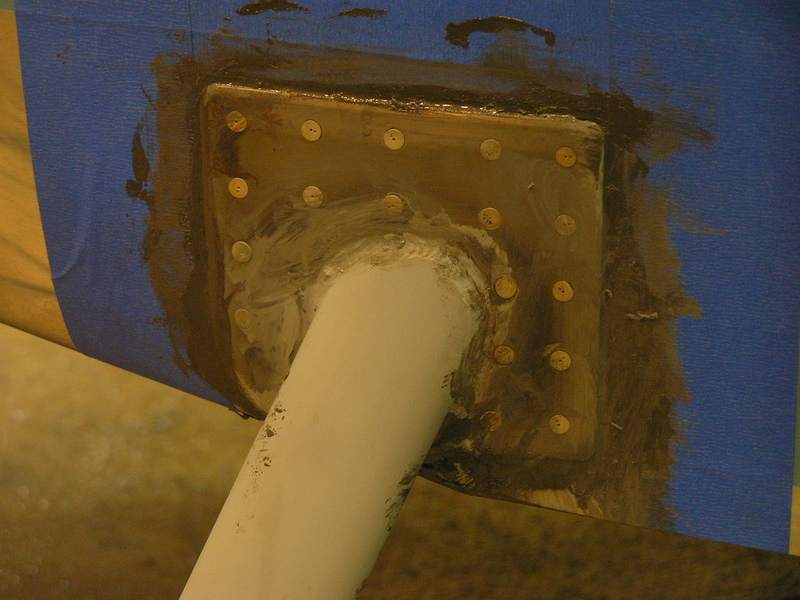 7/2/07 Drilled the F-6115 center rudder pedal bearing block and the two F-6116 side rudder pedal bearing blocks. Split the F-6115 block. 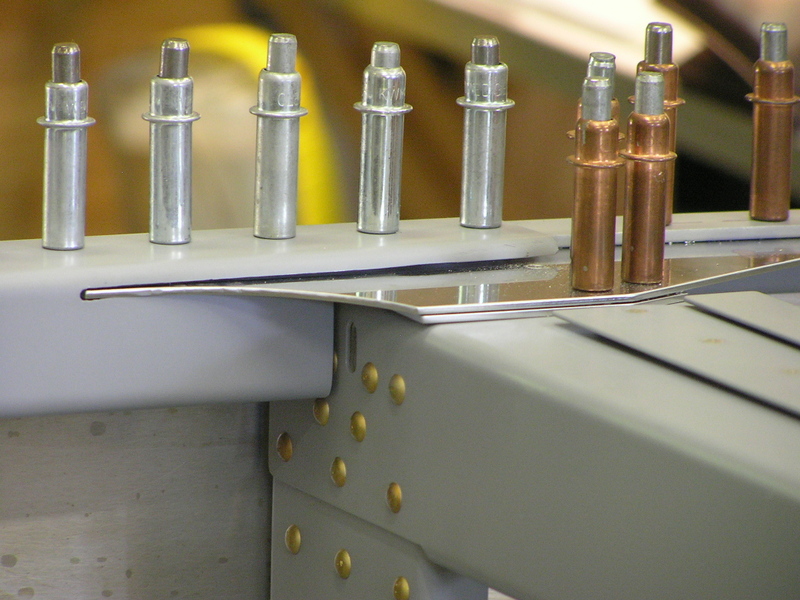 Measured and marked the F-6118 rudder pedal brace for drilling and cutting. 7/4/07 Fabricated the attachment angles for the brake pedals. Drilled the brake pedals and clecoed. I then scuffed in soapy water. I originally was considering having the brake pedals anodized but after talking with Mark Phillips, I will just prime and paint with the interior paint. That's what he did and after many, many hours of hard use, the pedals still look great. KISS. 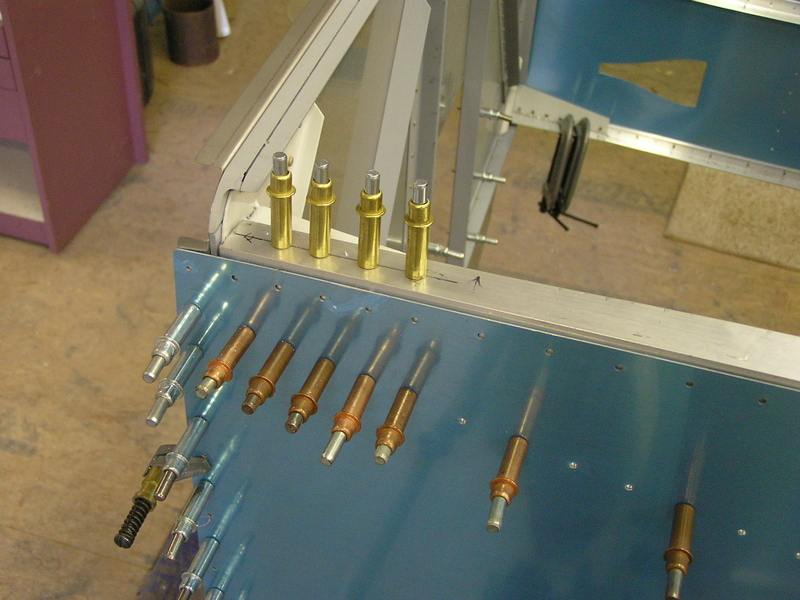 Assembled the rudder pedals and clamped in the fuselage. 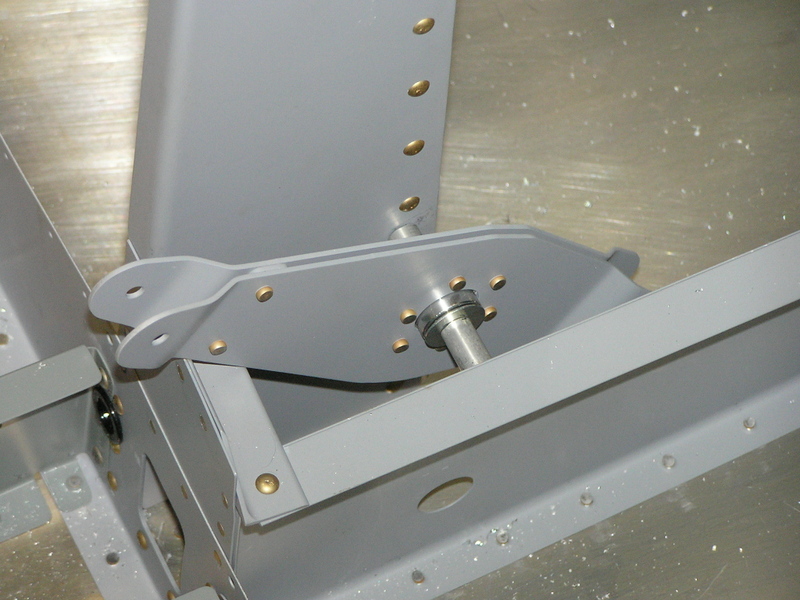 Trimmed the F-6118 rudder pedal brace and drilled and clecoed to the firewall support bracket. After I drill the alternate holes for the pedal positions I will trim the brace and cut the lightening holes. I previously ordered bushings, springs and stop collars previously from McMaster-Carr in order to make a spring return for the brake master cylinders. Others have reported problems with their brakes dragging without the springs forcing the cylinders to open. We'll see how well they work. 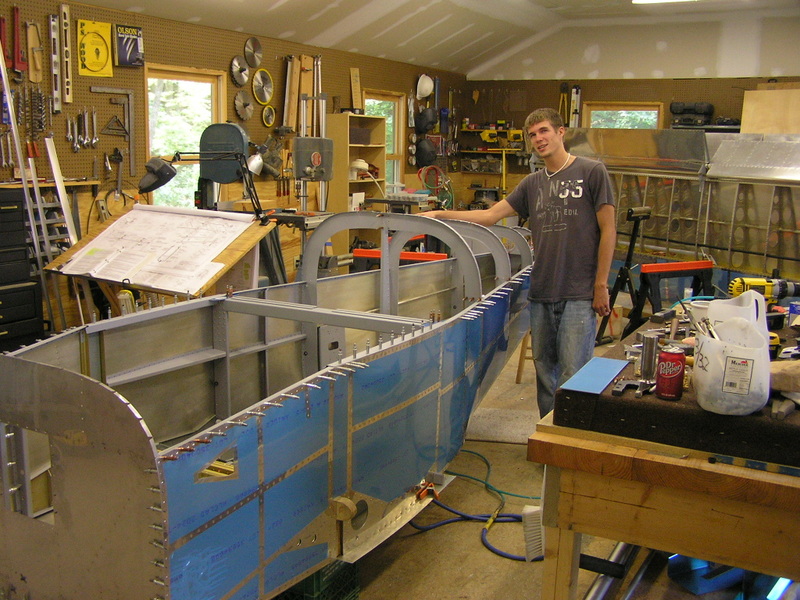 7/6/07 I had a number of small tasks to complete to finish up with the brakes and rudder pedals. 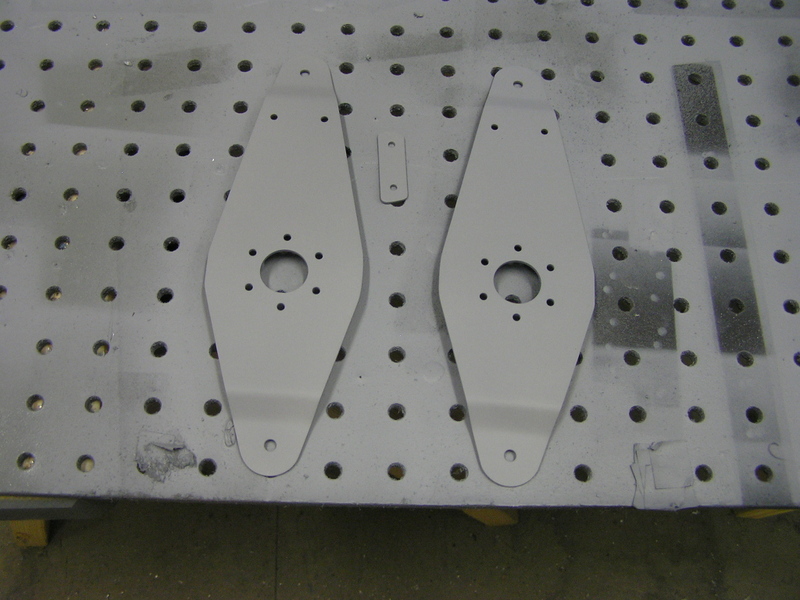 I started by removing the rudder pedals, auxiliary longerons as well as the F-904 bulkheads. On the bench I drilled the attachment holes (#10) using the bearing block as a guide. 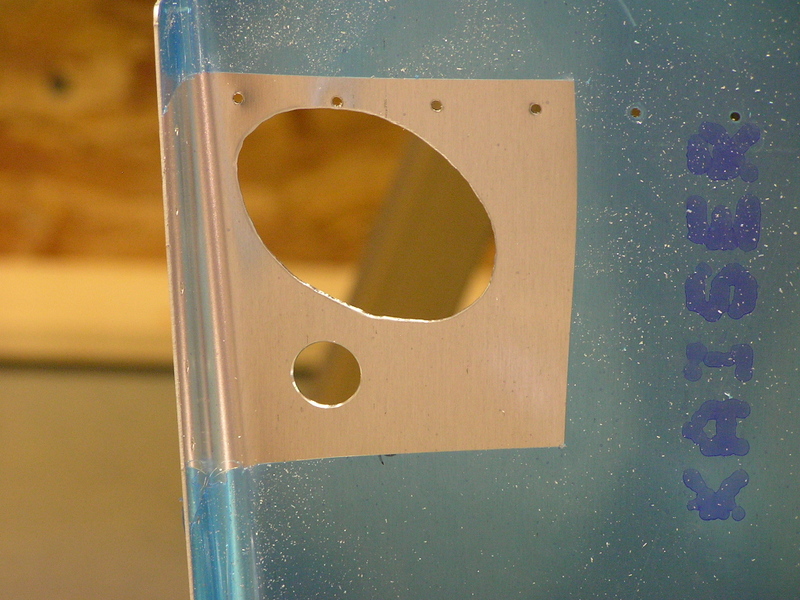 I then used a 5" piece of .063 3/4 x 3/4" angle and match drilled the holes. I then measured three additional positions at 1" increments in both longerons. Based on other builder's experience this should be enough adjustment for my needs. 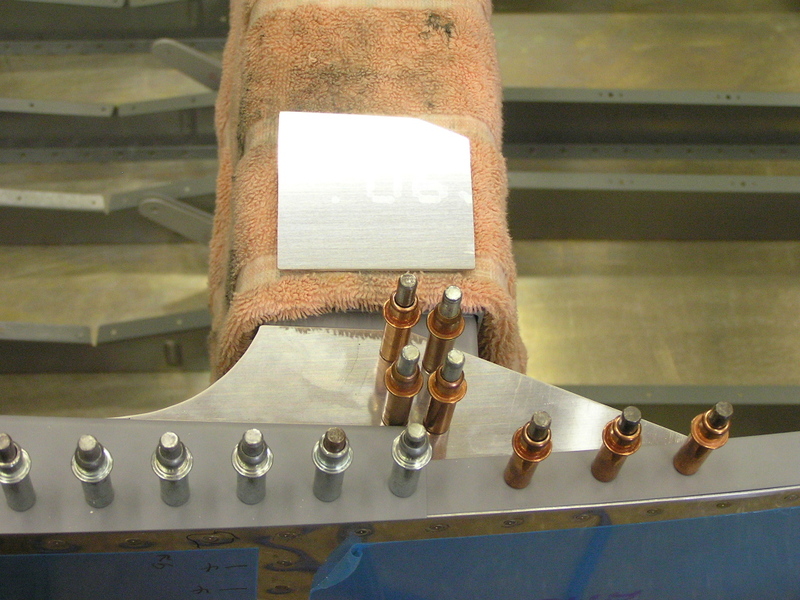 Next, I repeated the procedure and drilled the F-6118 rudder pedal brace bearing block and the three additional position holes. I measured out and drilled the lightening holes per the plans. I decided to not cut down the brace to shorten it. I bolted the bearing blocks in place and hand tightened the nuts. 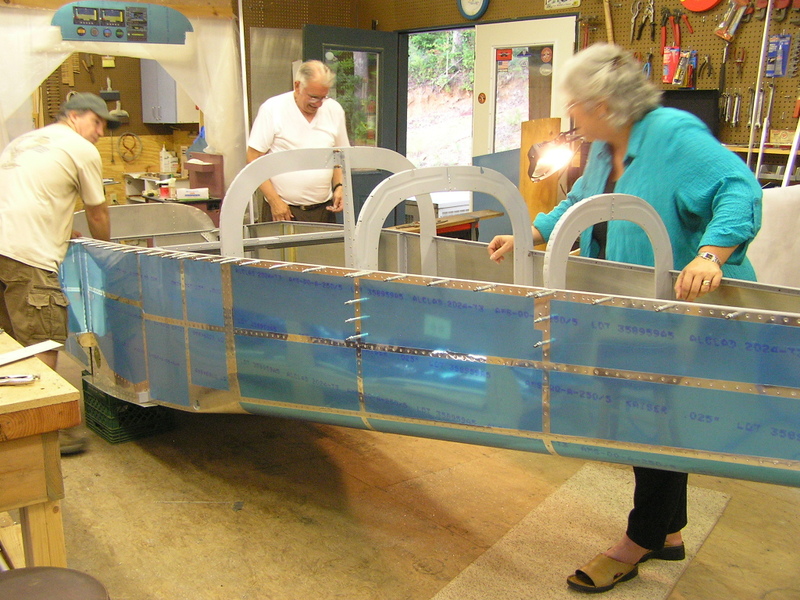 I set the rudder assembly aside. 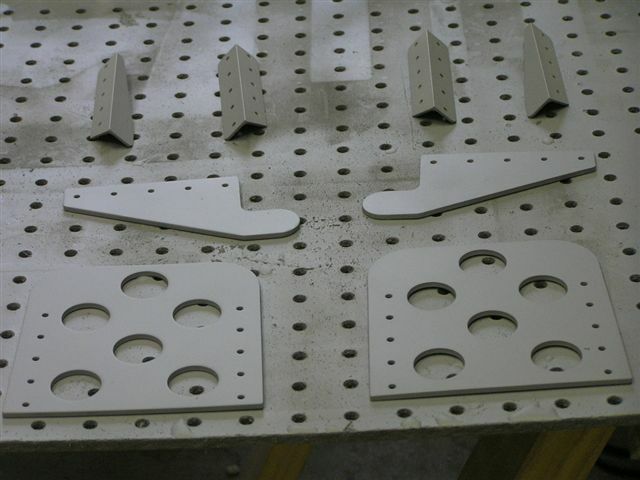 I primed the brake pedal components using self-etch primer. 7/7/07 Lynne selected the final spray color for the interior today. Looks like it will be a dark hammered gray and the brake pedals will be hammered black. I test fitted the floor angle braces. 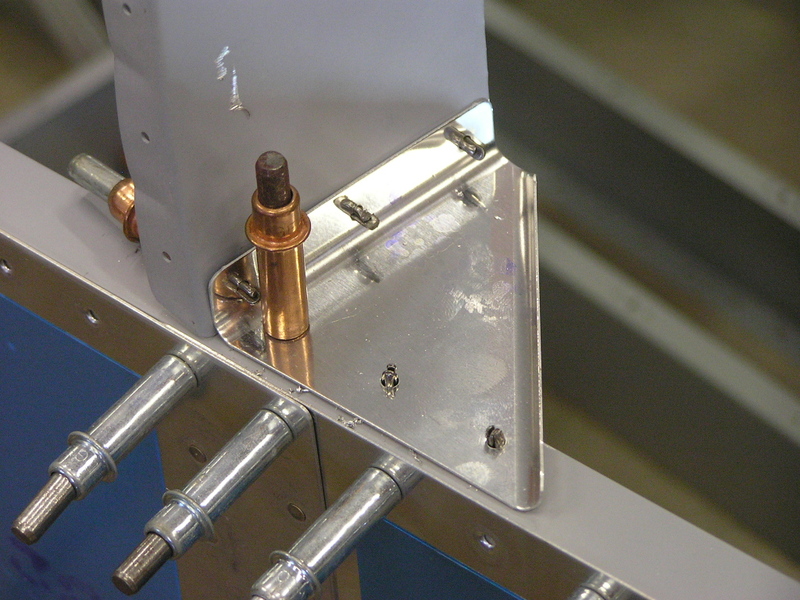 The innermost braces required trimming in order to fit flush against the F-601J angles. 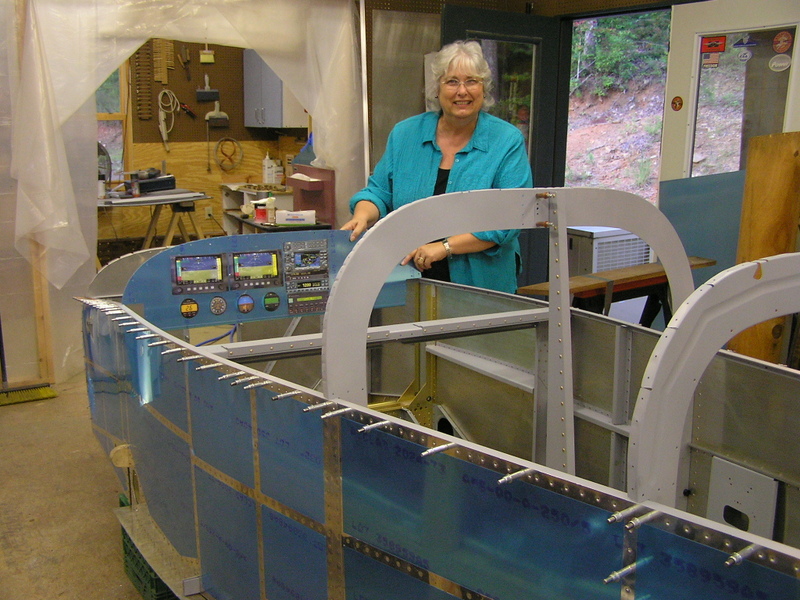 7/9/07 Tonight I got Lynne to help me drill the floor stiffeners to the bottom skin while I held them in place. 7/10/07 Finished by drilling the stiffeners to the F-983 cover support ribs and the F-601J angles on the firewall using the Dremel tool and a short #30 drill bit. 7/10/07 Clecoed the F-722 horizontal ribs to the side skins. 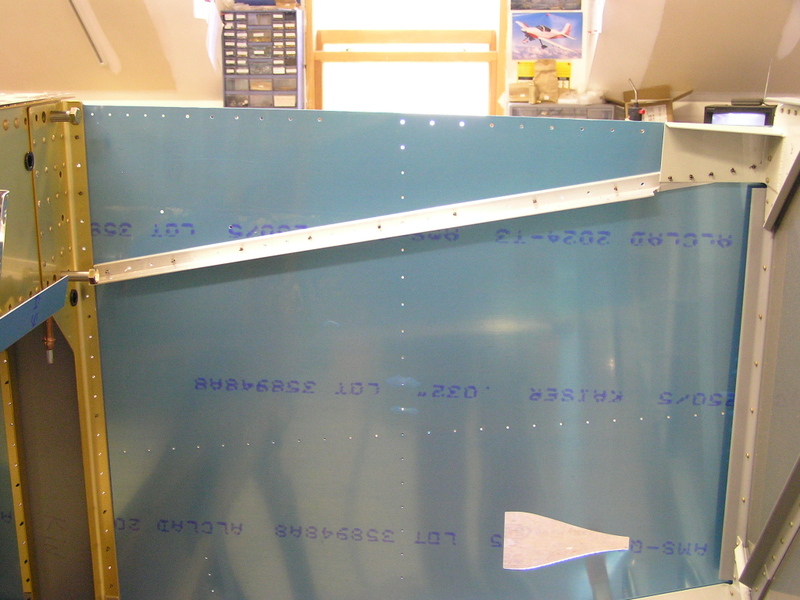 Fluted the F-724 horizontal ribs and clecoed to the side skins. 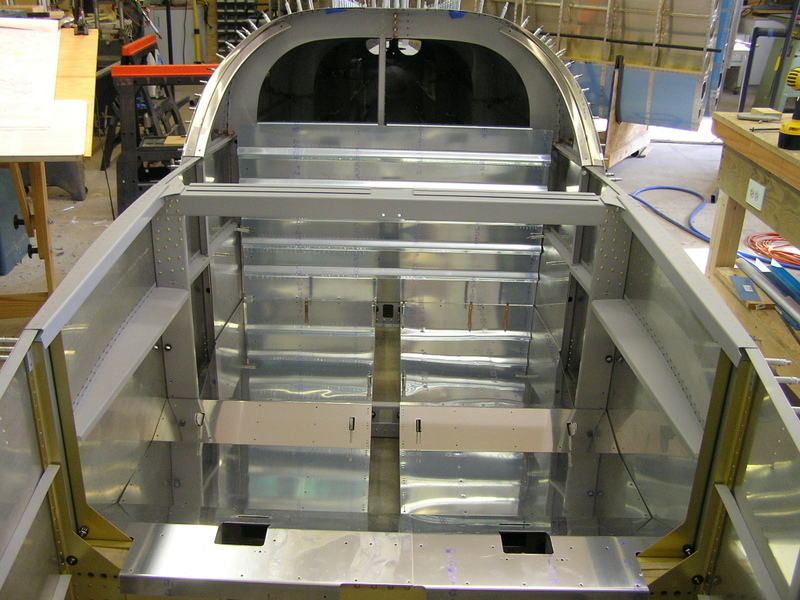 Clecoed the R&L F-750 aft baggage side covers to the F-722 and F-724 ribs. 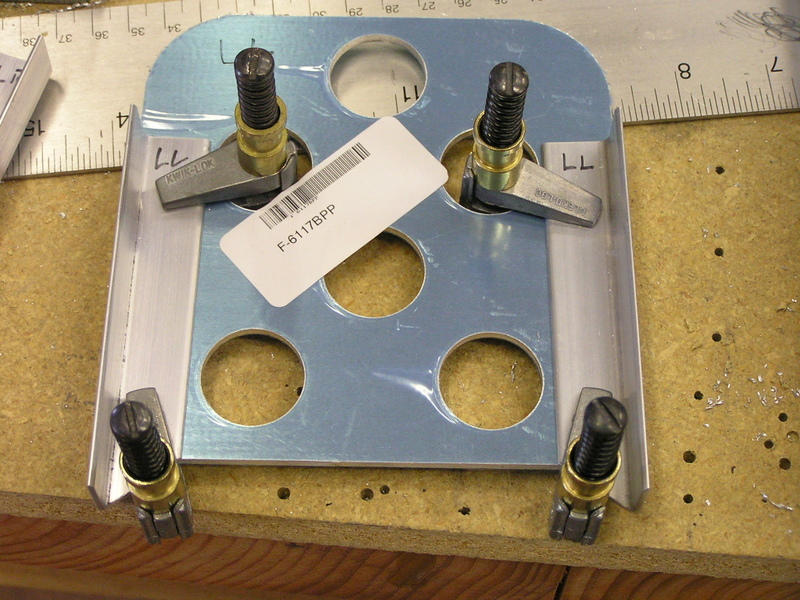 7/12/07 I received my AN3-60 bolts I had ordered from Wicks Aircraft today so I assembled the brake pedals to the rudder assembly. 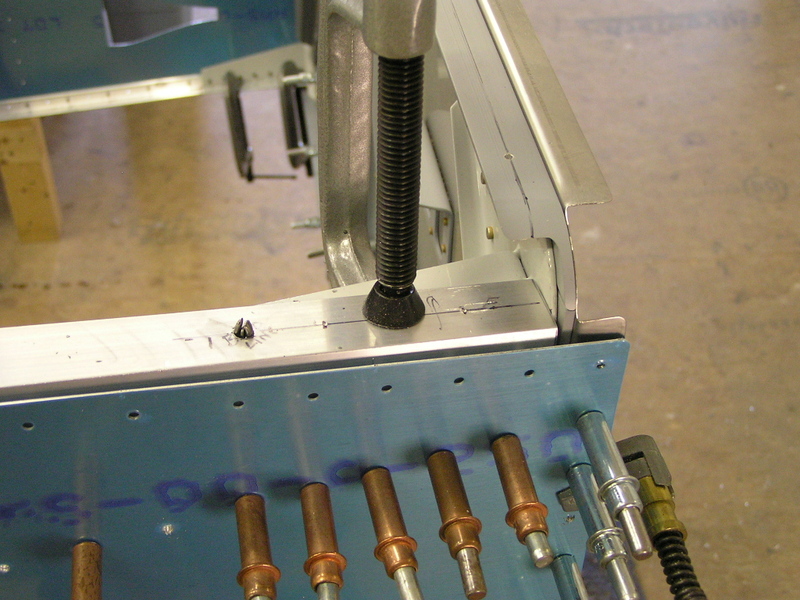 The plans call for two short bolts on each side of the brake pedal but several builders have stated that over time, the bolts start to flex and deform the holes. 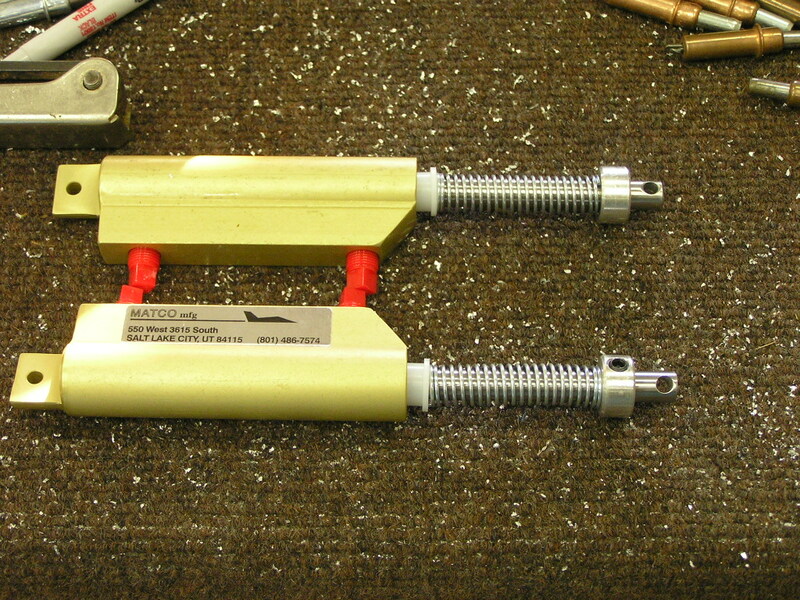 The simple solution (as well as a much better design) is to use one long bolt through both pedal attachments. 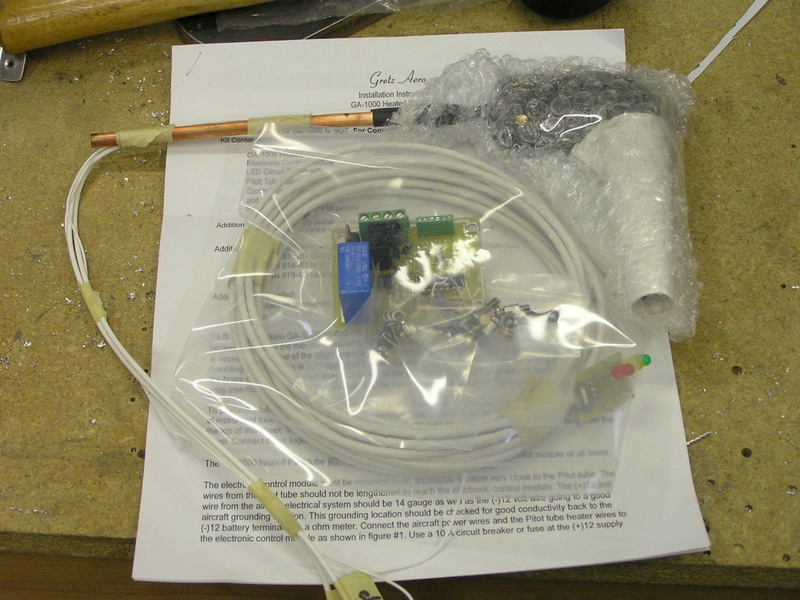 I also received my Gretz pitot tube. This is really a sweet piece of engineering. I had previously ordered and received the mounting tube and have already assembled it to the left wing. 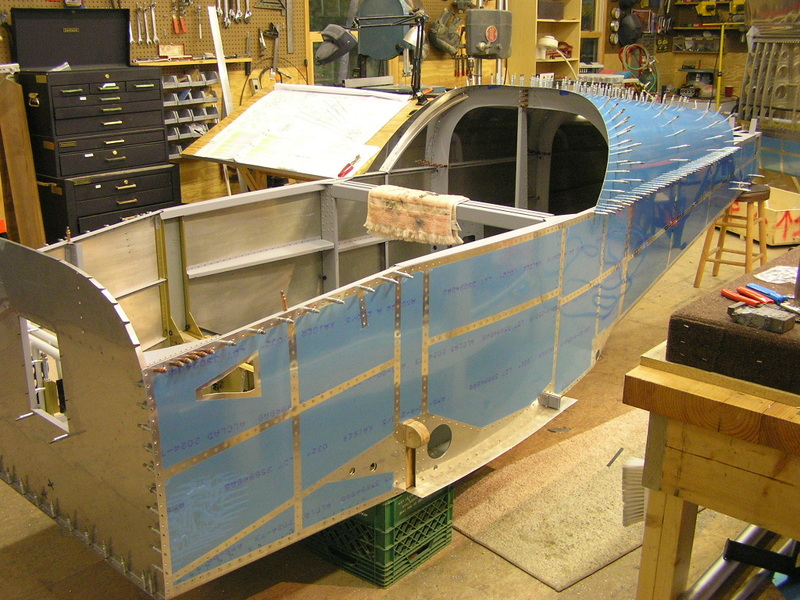 7/13/07 Tonight I match-drilled all the holes in the forward fuselage I had put off doing. 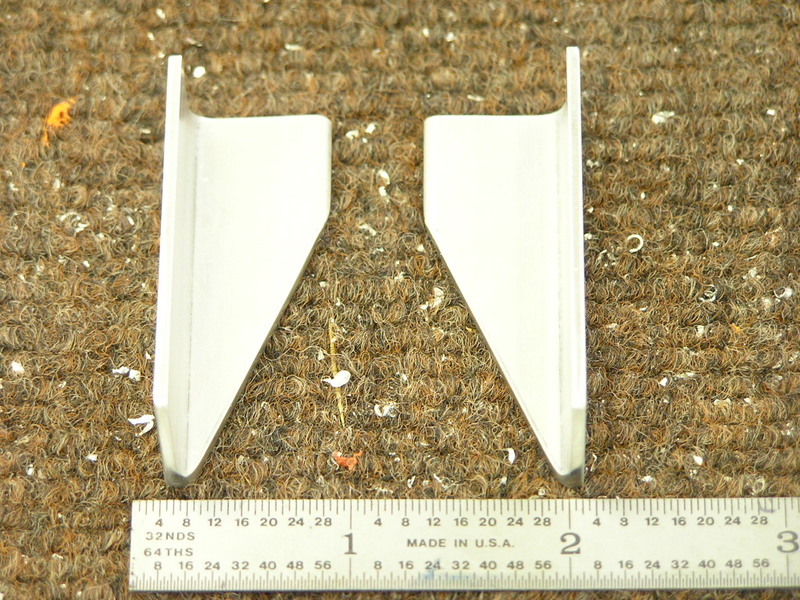 I also received my rudder cable fairings from Avery Tools. 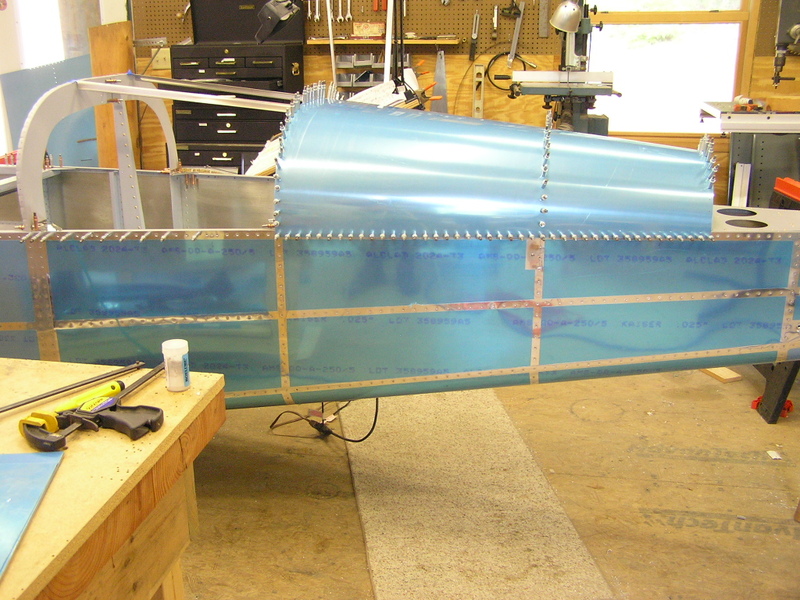 I trimmed each fairing and drilled them to the fuselage. 7/20/07 I decided to take a day off work in order to get a jump start on the prep work. 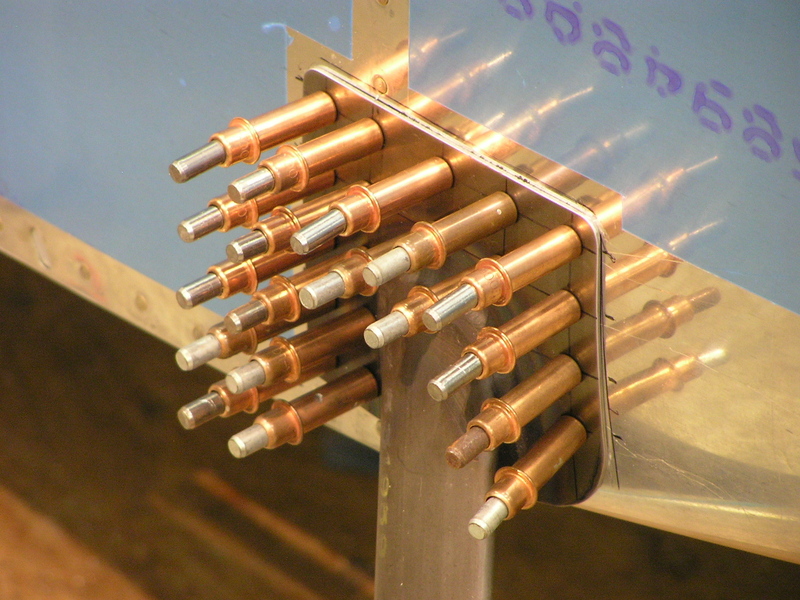 I finished countersinking the longerons as well as the forward fuse angles. I also deburred the firewall and the forward bottom skin. 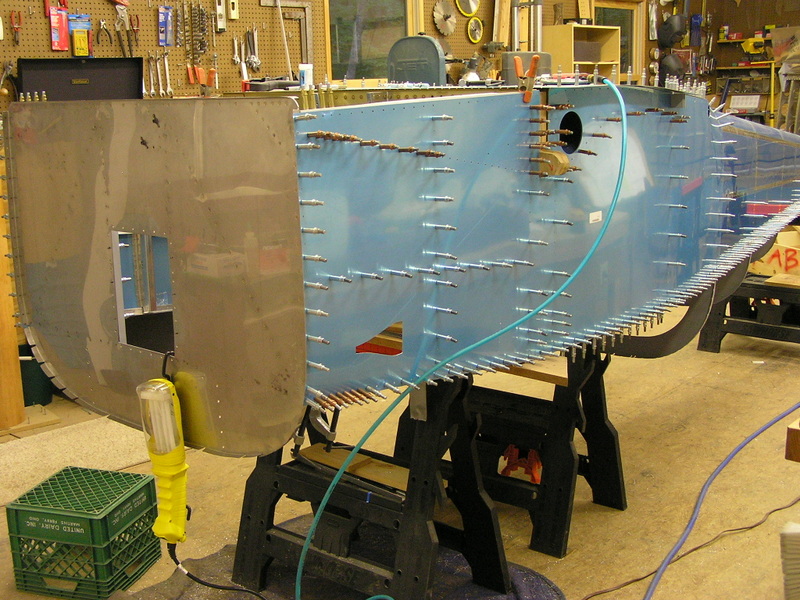 Finally, I dimpled the bottom skin and separated the aft fuselage and center section in order to deburr and dimple the remainder of holes for riveting. 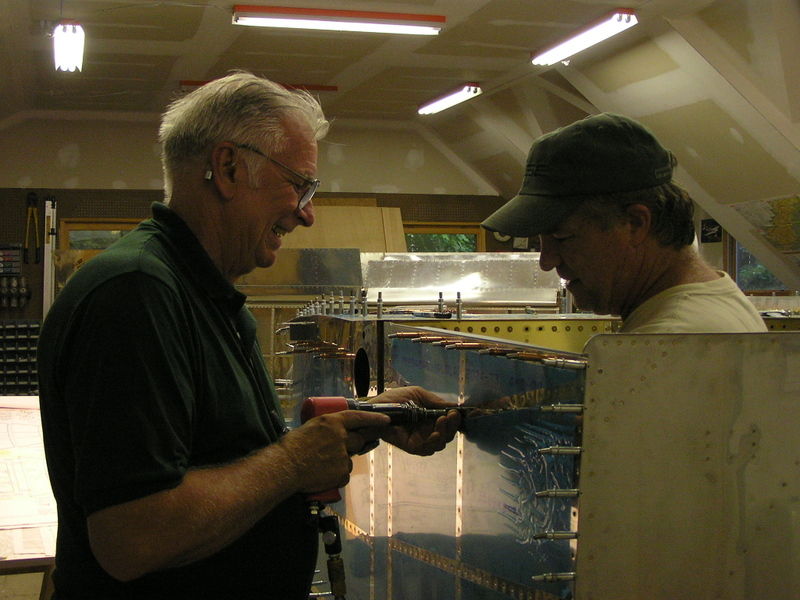 7/21/07 Continued to deburr and countersink and dimple. 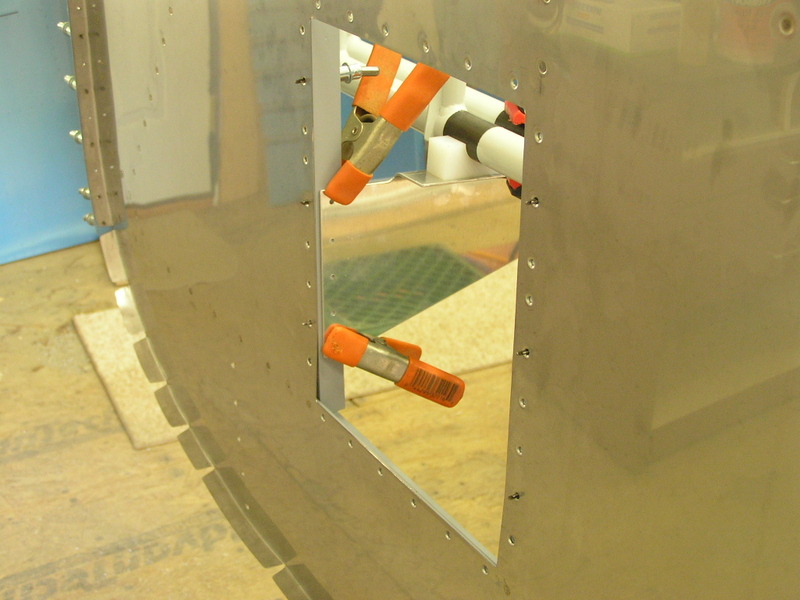 I beveled the bottom skin where it overlaps the aft fuselage. 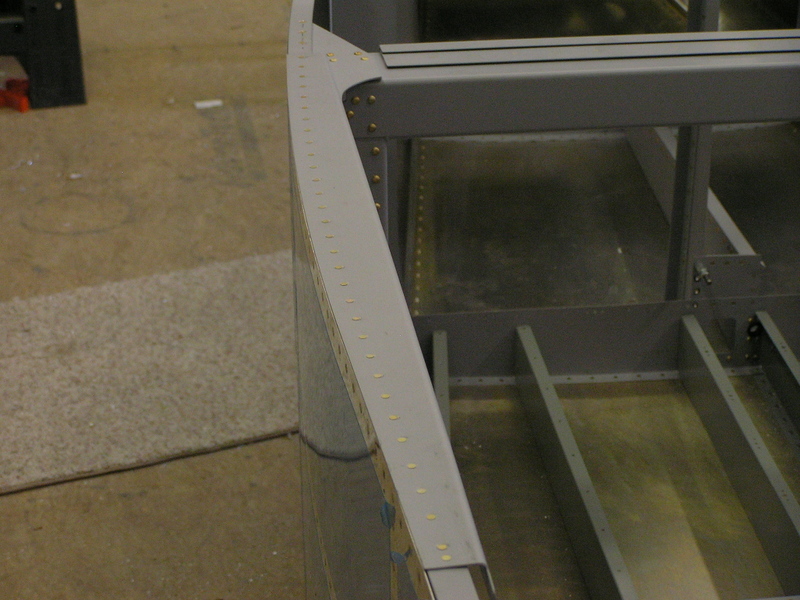 I dimpled the remaining holes in the aft fuselage along the longerons. I also scuffed the various parts and F-972 forward bottom skin with soapy water and then primed with SEM self-etching primer. I deburred the right side skin and drilled the 1" hole for the fuel line. 7/22/07 Today I dimpled the right side skin and started deburring the left side skin. 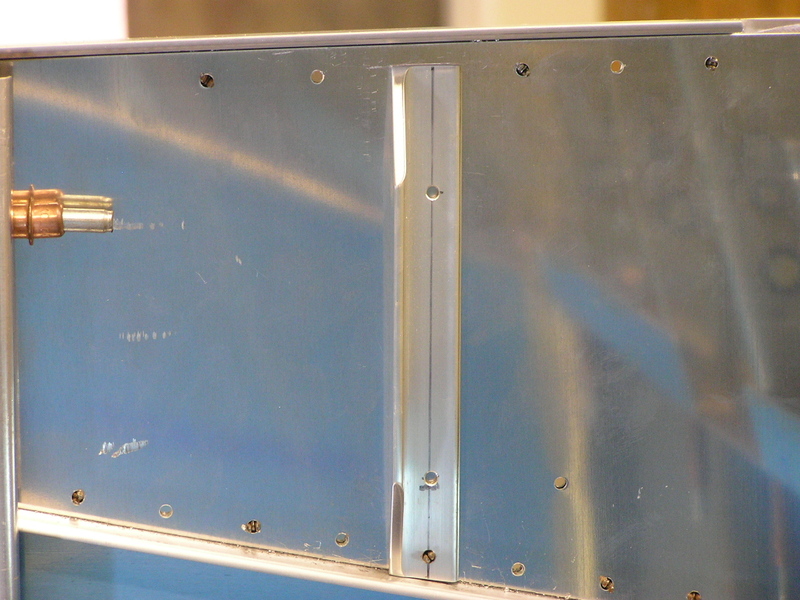 I also dimpled the flange of the firewall. 7/25/07 Deburred left skin and started dimpling. 7/27/07 Finished dimpling the left skin. It was an overcast morning so I set up the sawhorses out back and scuffed the skins. I had never Sanchem'ed the wing top skins so I drug them out and knocked it out along with the fuse side skins. 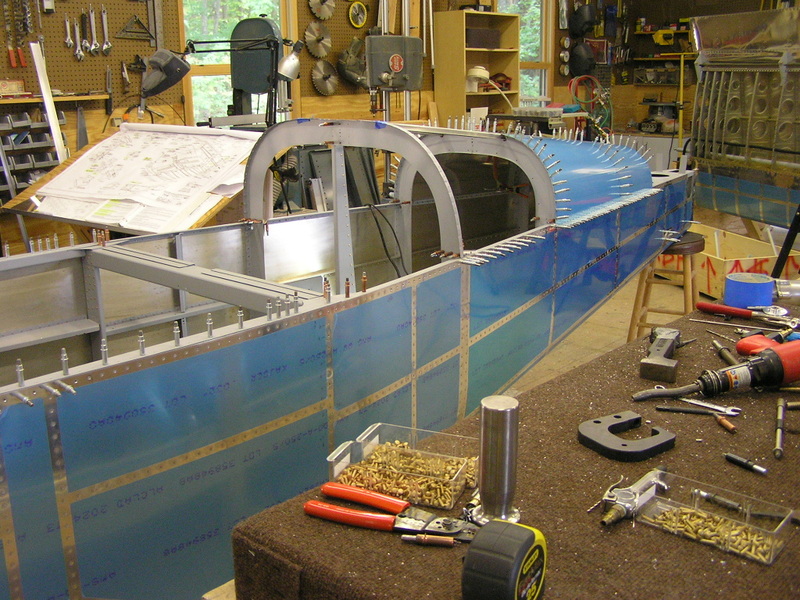 Next, I re-connected the aft fuselage with the center section and re-installed the main longerons. 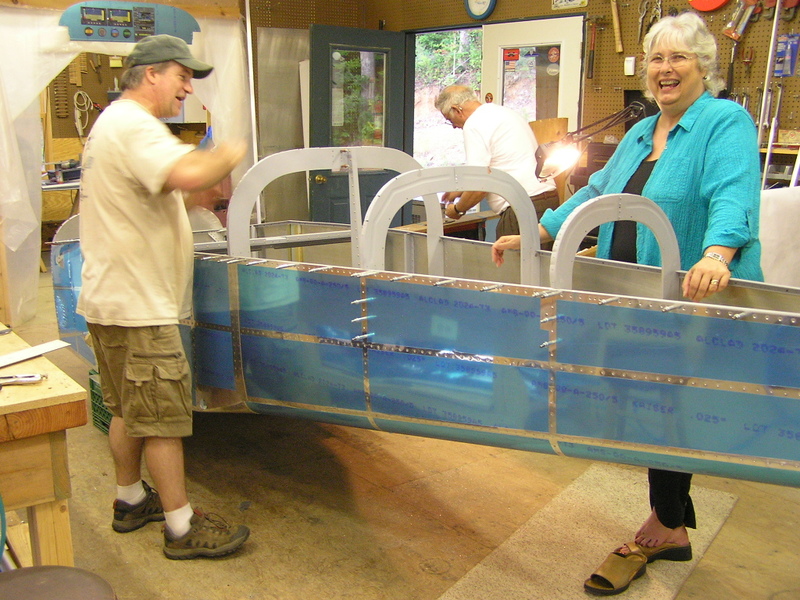 7/28/07 Our good friends, Bill & Peggy Martin, came up for the concert at the John C. Campbell Folk School Friday evening and are spending the weekend with us so I drug Bill over to the shop to help rivet. Lynne and Peggy played their dulcimers all weekend. It was a toss-up as to who had a better time. 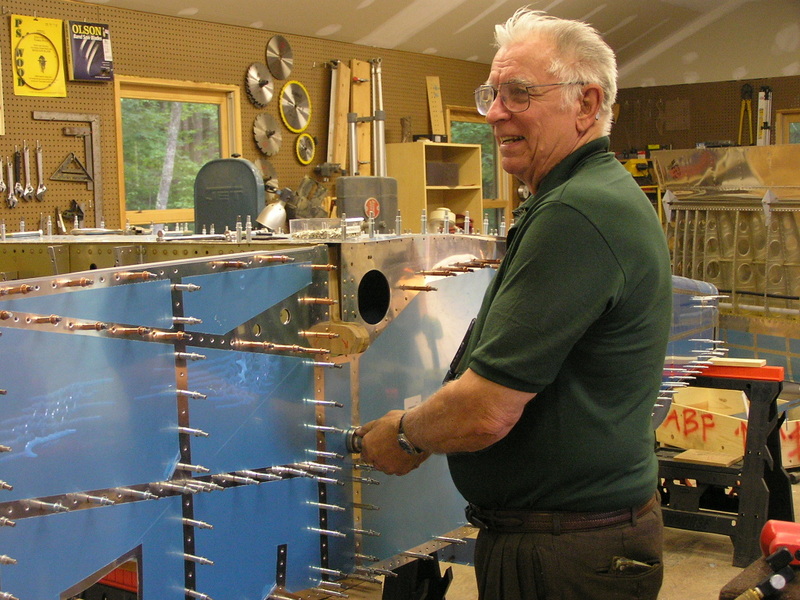 Bill and I were able to get the left side skin riveted and about half of the right side. 7/29/07 Well, all I can say is that Bill got the "RV Fever". He was determined that we were going to finally roll the canoe and he told Peggy they were going to stay until we were done. O.K., so early Sunday morning we were at it. I have to admit, he was a tremendous help. We finally drove the last rivet and flipped that puppy over. Good times. 7/30/07 Riveted the side skins to the longerons. 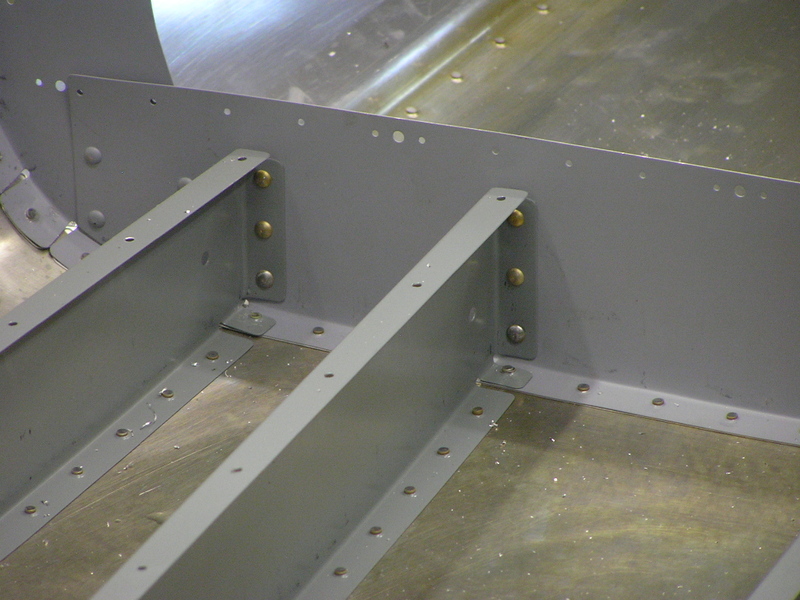 7/31/07 Riveted the floor stiffeners to the firewall brackets. 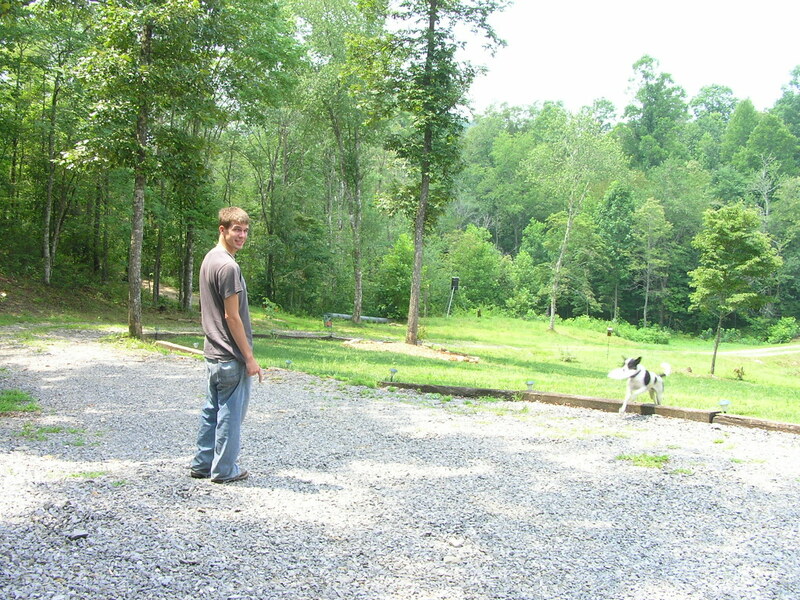 8/3/07 My son, Dustin, is visiting so I got him to help me with a few rivets I couldn't reach by myself. Next, I clamped the aft deck in place and drilled. I can't locate the AS3 material I need in order to fabricate the aft deck spacers so I called Vans and placed the order. 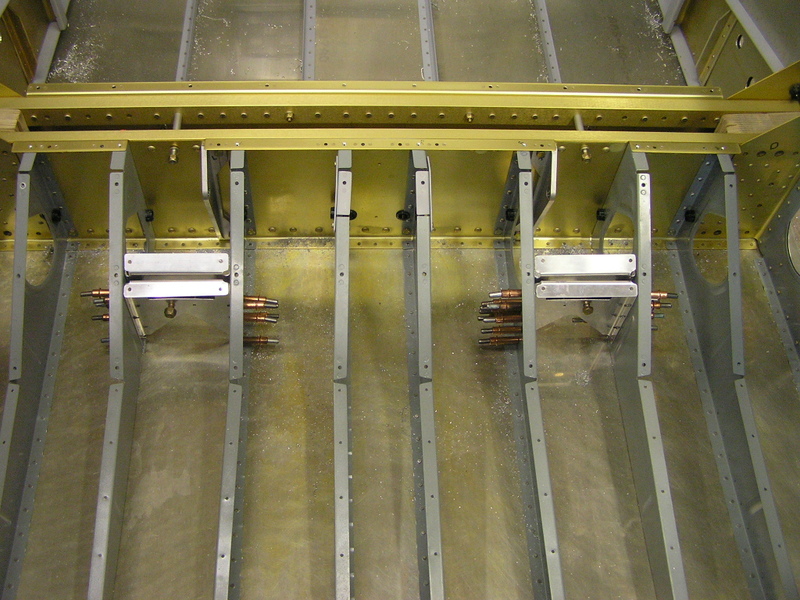 I also finished attaching the brake pedals to the rudder bars. Finally, I worked on the F757 gussets. After fabricating and match-drilling, I was not satisfied with the fit. 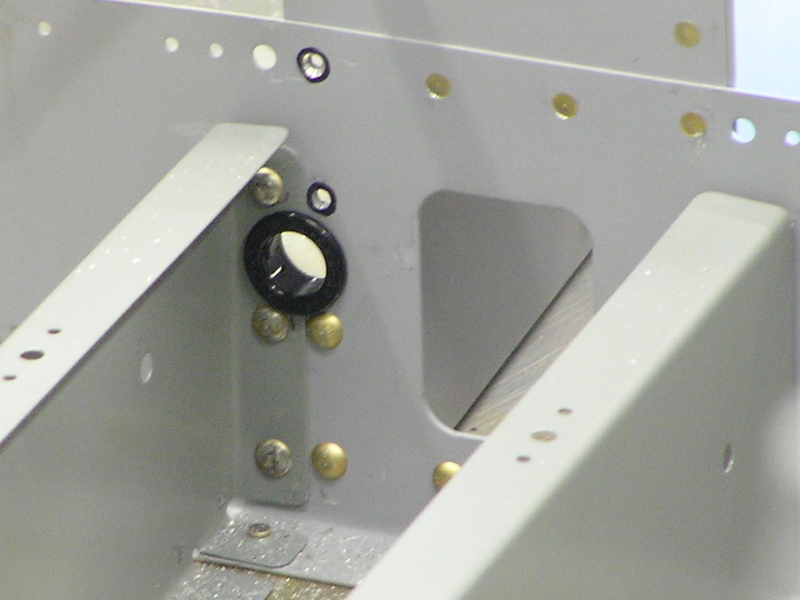 The gusset has a gap of about 1/16" between it and the F905 bulkhead. 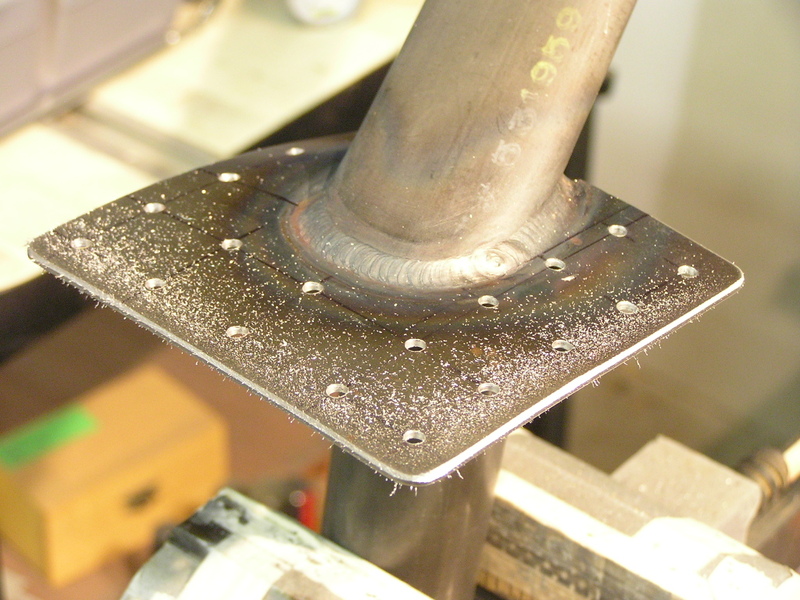 I fabricated a spacer out of .063 sheet and placed it below the gusset. I like the fit much better now. 8/5/07 I just heard from Bill Repucci. 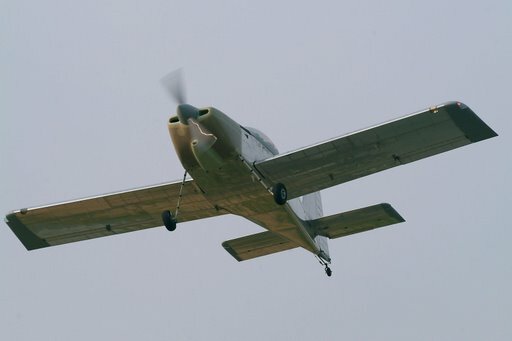 Congratulations on the first flight of his RV-9! 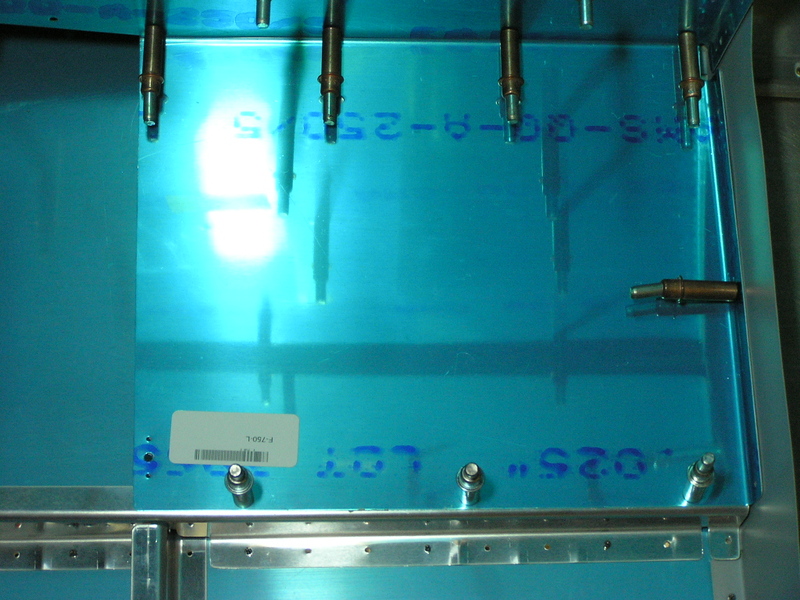 Tonight I trimmed, deburred, measured, marked and drilled the F-695 forward fuselage gussets. 8/17/07 I have not been able to work much lately. My father, who lives in Lockhart, TX, is terminally ill so I have been to see him this past week. Tonight I drilled the rear seatbelt attachment brackets to the longerons. 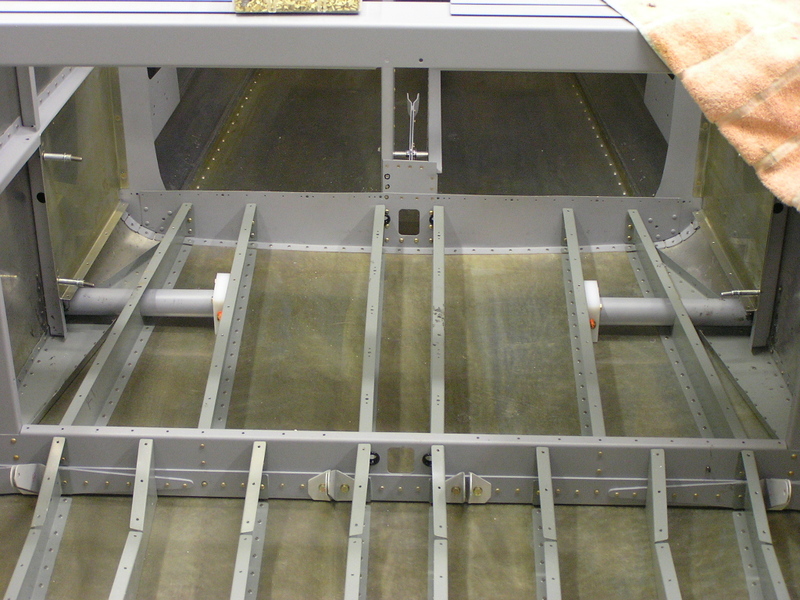 I also removed the aft deck in order to fabricate the F-710C and F-711E spacer bars. 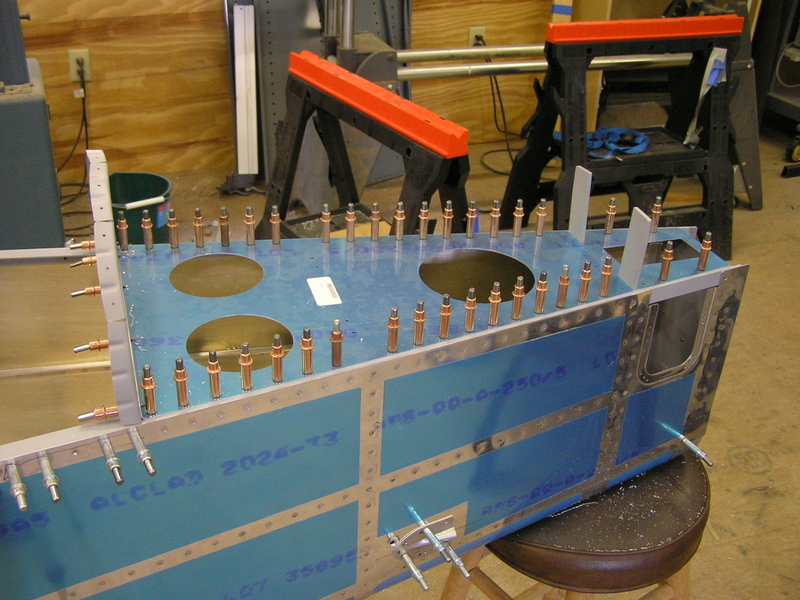 8/18/07 I fabricated the F-710C and F-711E spacer bars and back-drilled them through the aft deck. I took it all apart and scuffed and deburred the spacers, aft deck as well as the firewall gussets and the F-757 plates. 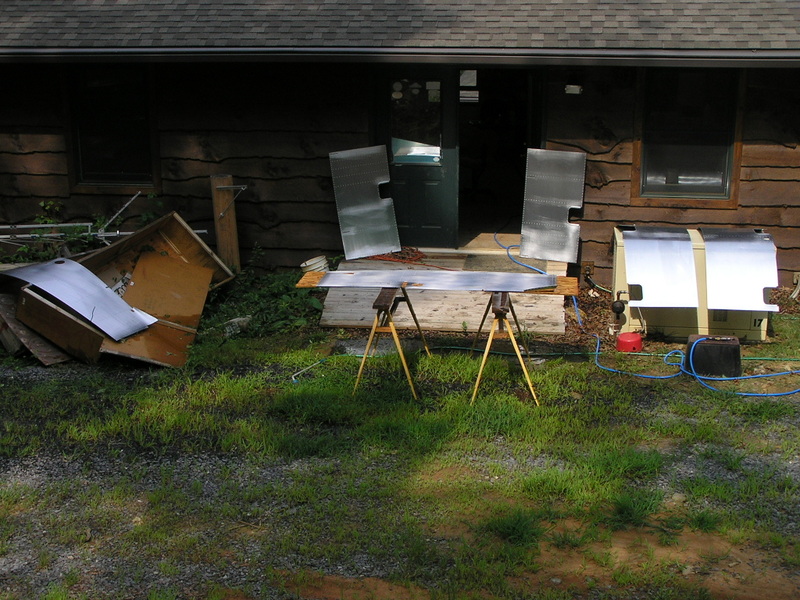 Next, I acid-etch primed. 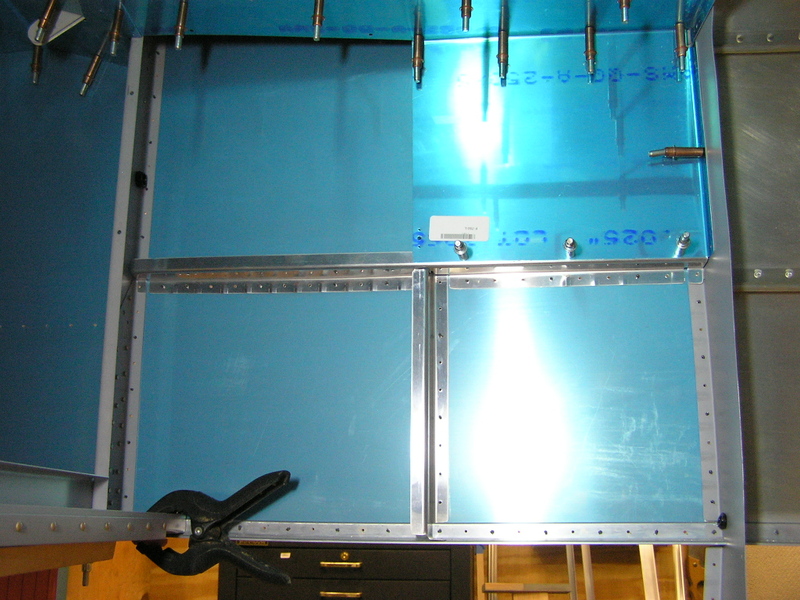 I riveted the aft deck permanently as well as the F-709 bulkhead. I then riveted the firewall gussets. Have I mentioned how having a pneumatic squeezer is a joy? 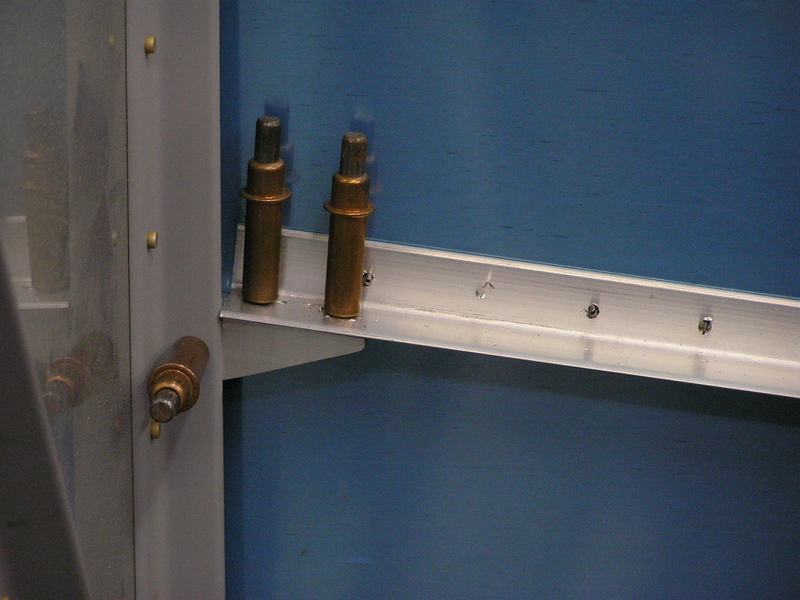 There were only two rivets per side I could not reach with the squeezer. Can you tell which ones they are? 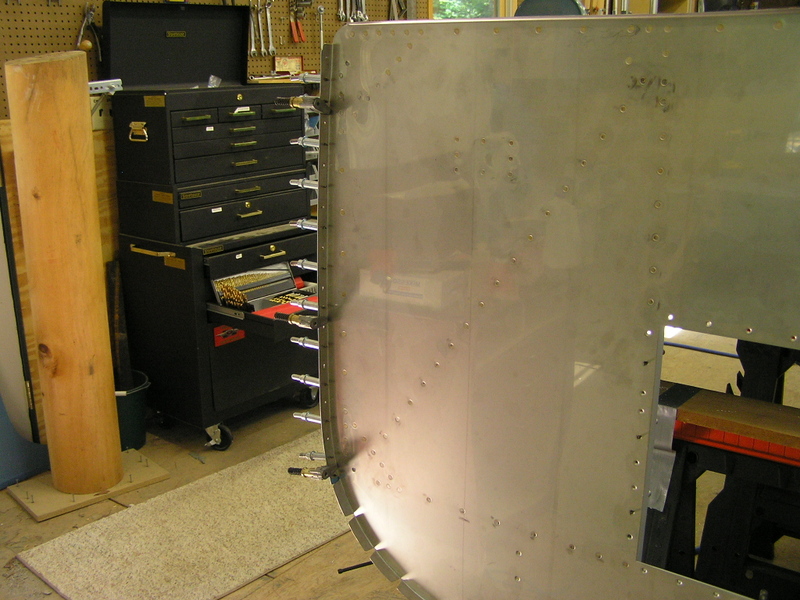 8/19/07 I finally got around to riveting the baggage floor ribs to the F-706 bulkhead. The problem here is that only about half of the rivets can be reached with the squeezer and the rest have to be shot and bucked. I took a lot of time here to make sure the rivets were perfect since drilling any out would have been quite difficult. I used the dremel tool to clean up the hole for the snap bushings in the tunnel. 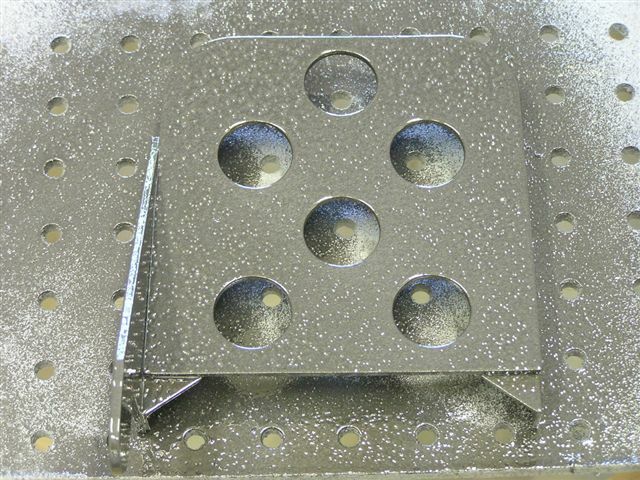 I drilled the F-656 gusset plates to the F-706 bulkhead. 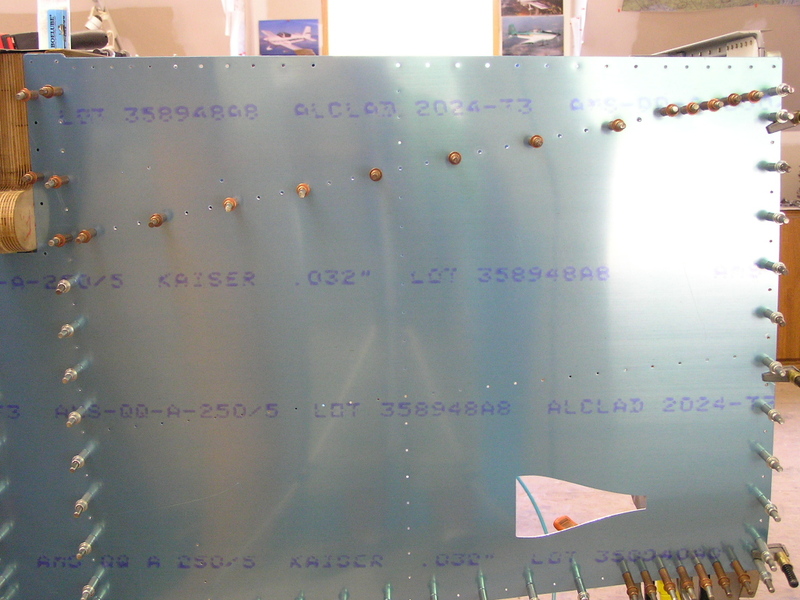 I riveted the F-757 plates to the longerons as well as the aft canopy decks. 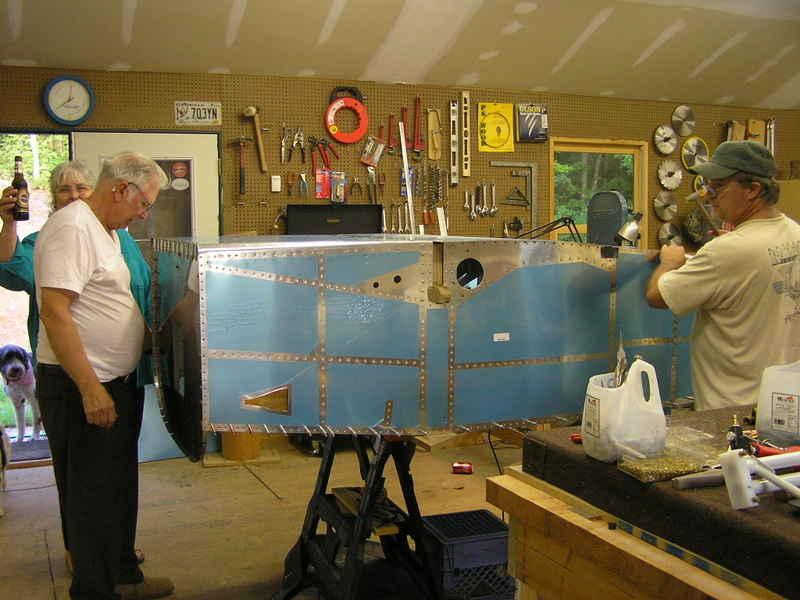 8/19/07 I clecoed the aft top skin. 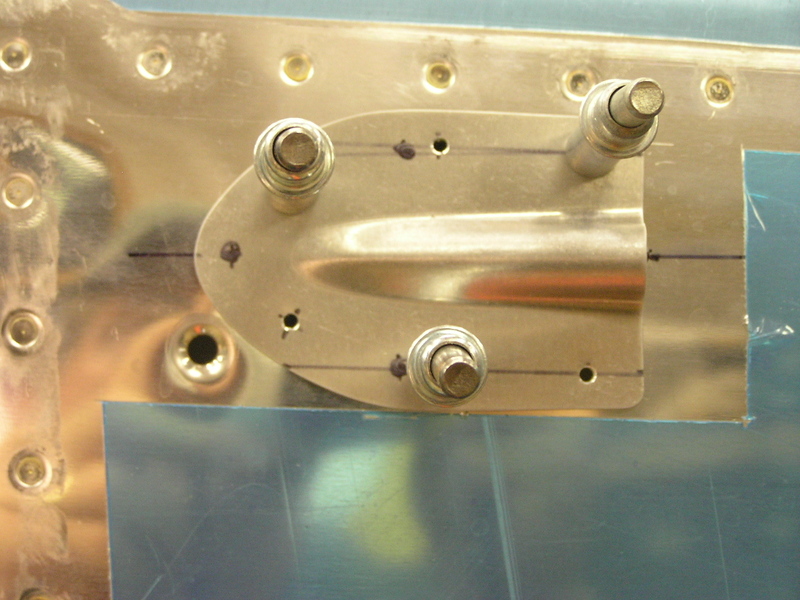 8/20/07 I inserted two rivets remaining in order to finish the bellcrank support. 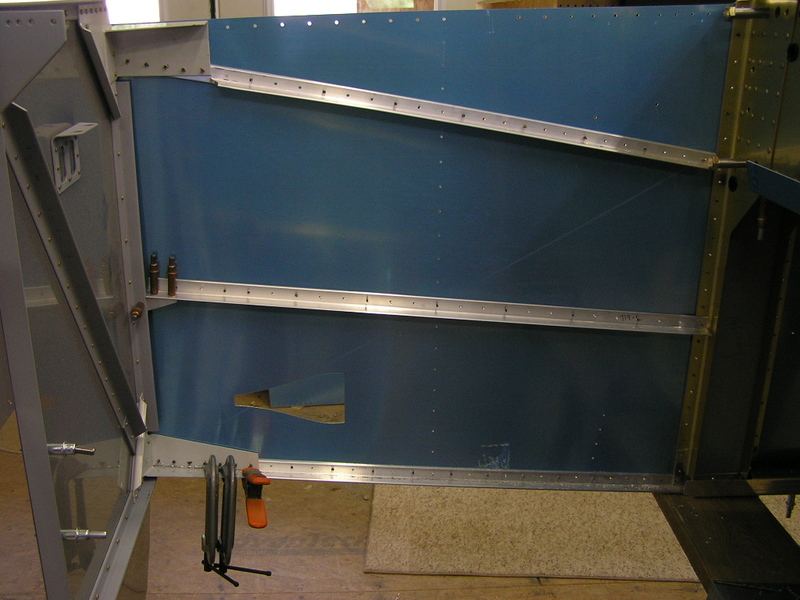 I fabricated the F-707B angle clip and clecoed to the F-707 bulkhead. 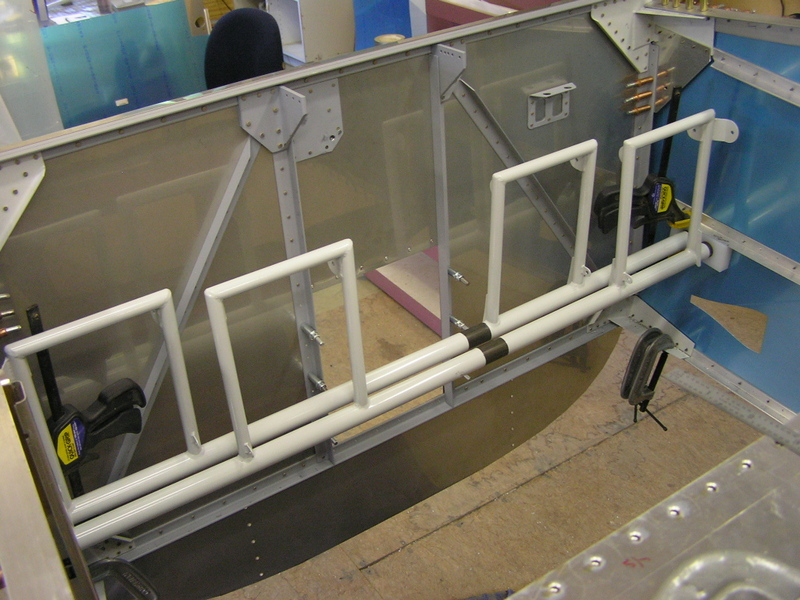 I clecoed the F-787 stiffener web to the F-706 bulkhead and clamped the aft end to the F-707 bulkhead. I fabricated the F-635 elevator bellcrank assembly and test installed. The F-635 spacers were fabricated and trimmed for a nice snug fit. 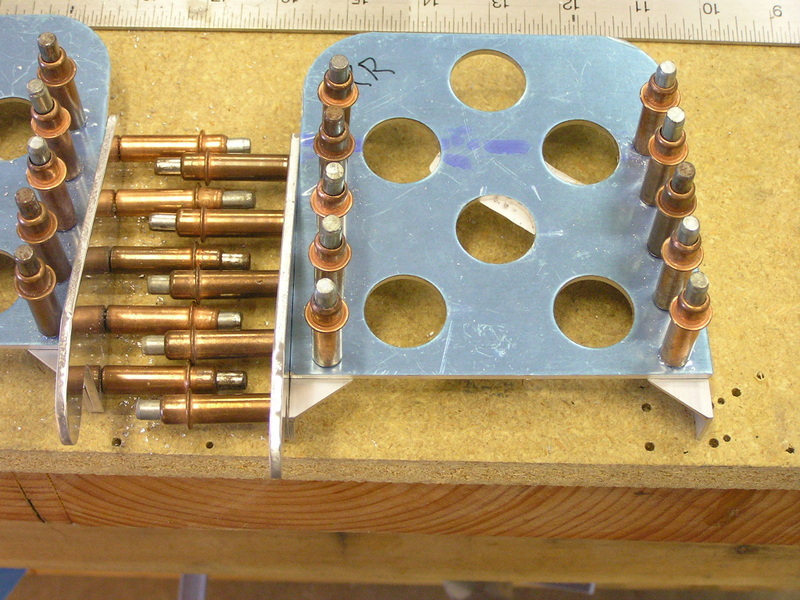 I clamped and match-drilled the rear F-656 L&R gusset plates to the F-707 bulkhead and longeron and clecoed. 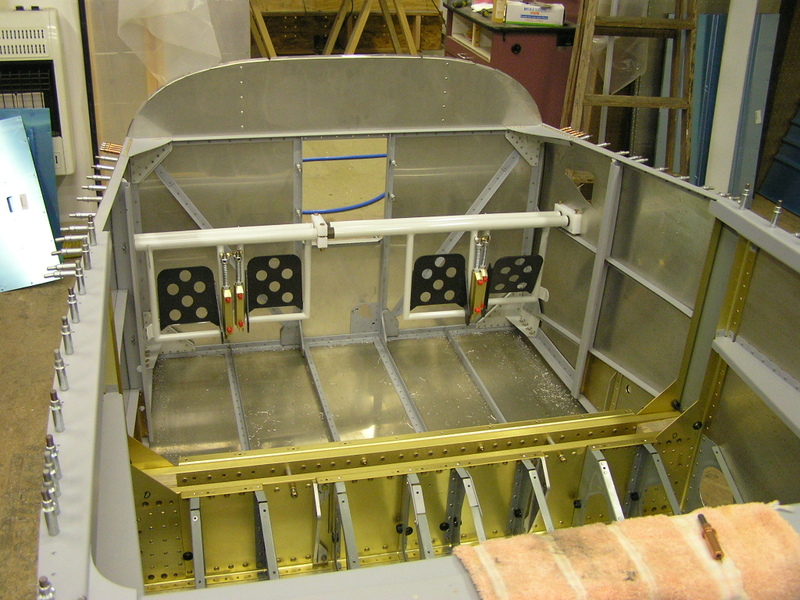 (I had previously drilled and clecoed the forward gussets to the F-706 bulkhead). Clecoed the F-7112 Forward Top Skin to the F-707 and F-706 bulkheads. 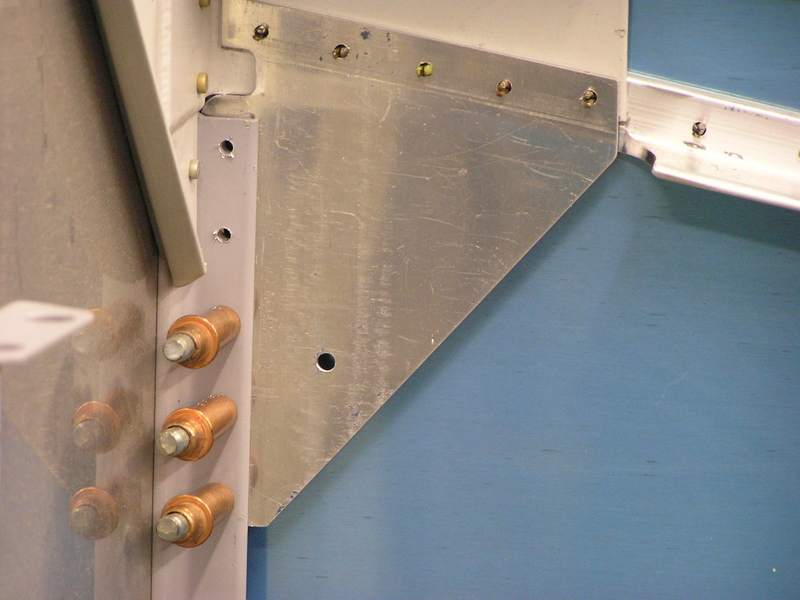 Installed the F-788 Gusset Plate. 8/23/07 Today, I called Craig Catto and ordered my prop. It will be a 3-bladed wood/glass composite. The blades will be 66" and pitched to 74". Craig builds the finest props in the world and they are a work of art. I can expect delivery around 1/14/08. I match-drilled the top skins to full size and drilled the J-stringers. I then un-clecoed the left side and drilled the F-707 brace to the F-707B clip and clecoed. I then drilled the F-707B clip to the F-707 bulkhead and clecoed. 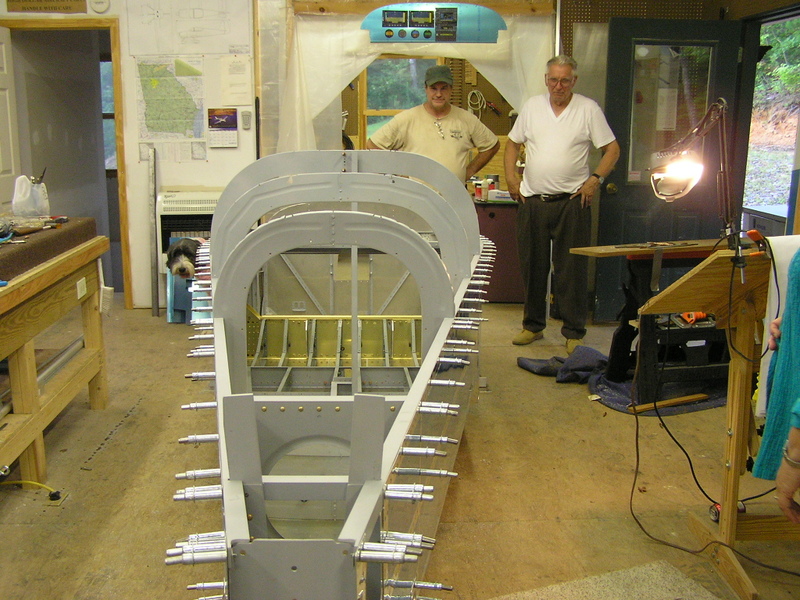 8/24/07 I installed the F-6111 ribs by first marking the centerline. I then ground the bottom of the ribs to be flush with the top of the longeron. I then started at the bottom and drilled each hole and clecoed as I went. 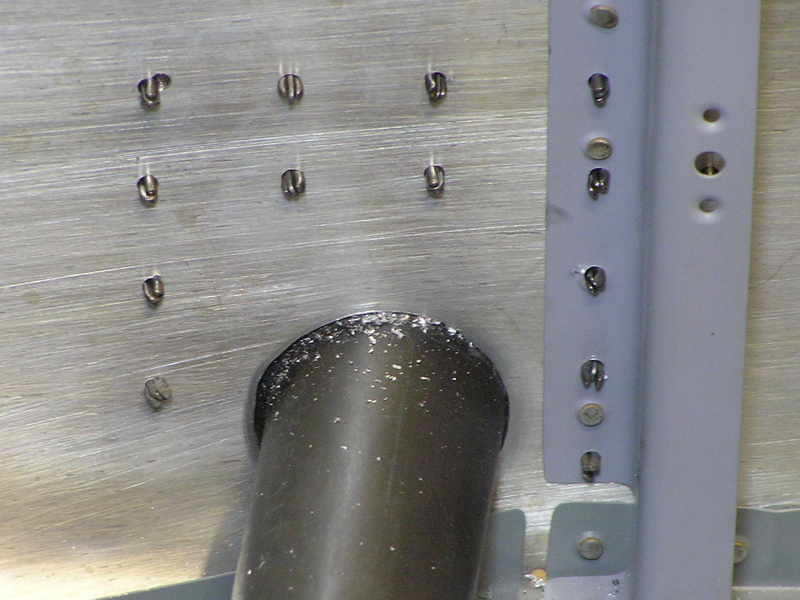 At the top I needed to grind each rib to allow them to sit against the F-707 bulkhead. I started with the left side and initially fit the step. 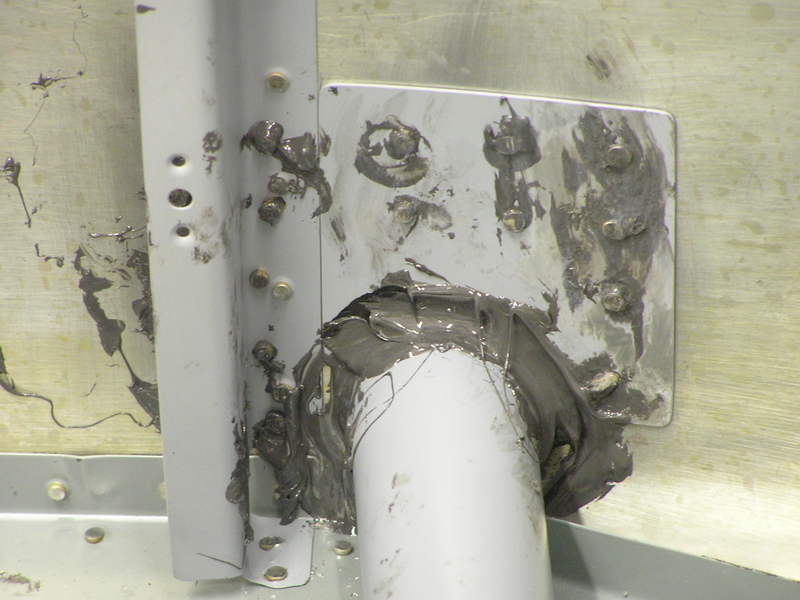 The tube was hitting the baggage rib web and was holding the flange of the step about 1/8" away from the side skin. I ground the tube until it was flush with the skin. I then used a rubber mallet to bend the flange until the step rested smooth against the side skin. 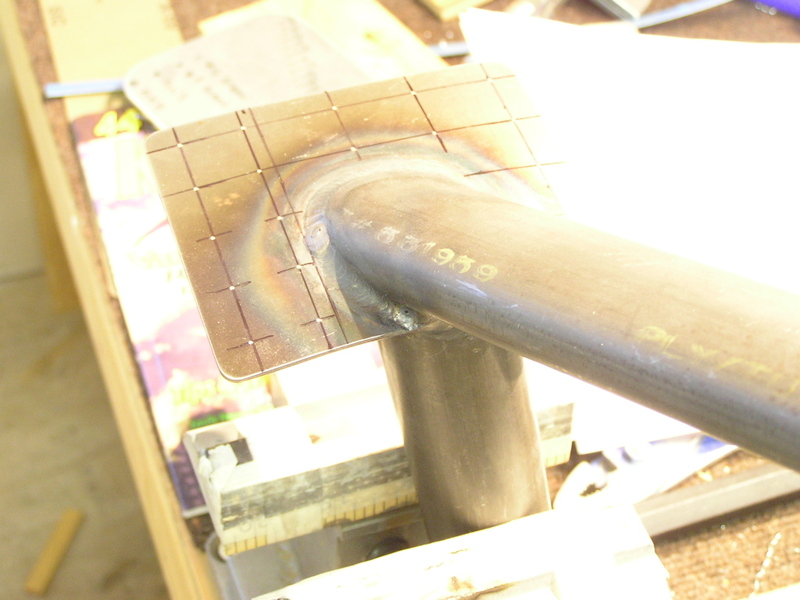 I then rounded the corners of the flange at the grinder. 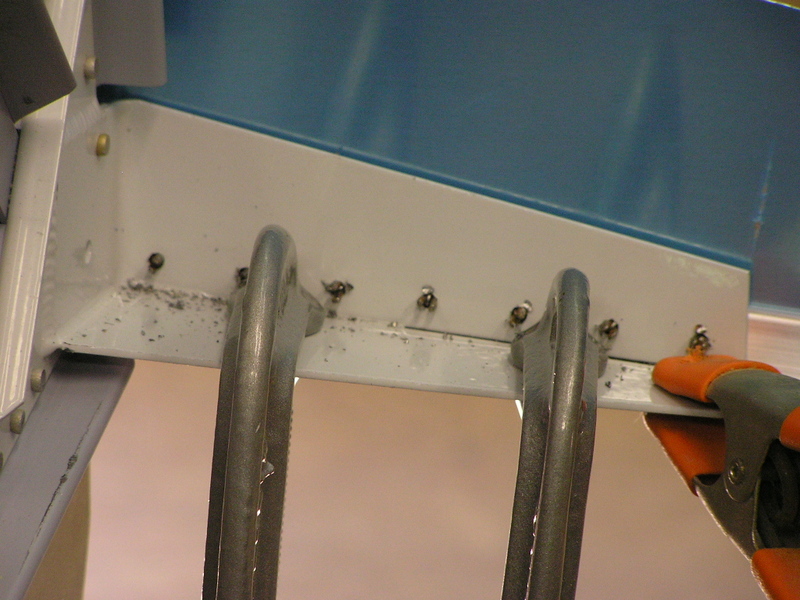 I marked the rivet lines with a Sharpie being careful to align with the baggage side rib. I drilled all 16 holes to #30 and deburred. I marked the phenolic blocks and drilled to #11 on the drill press. 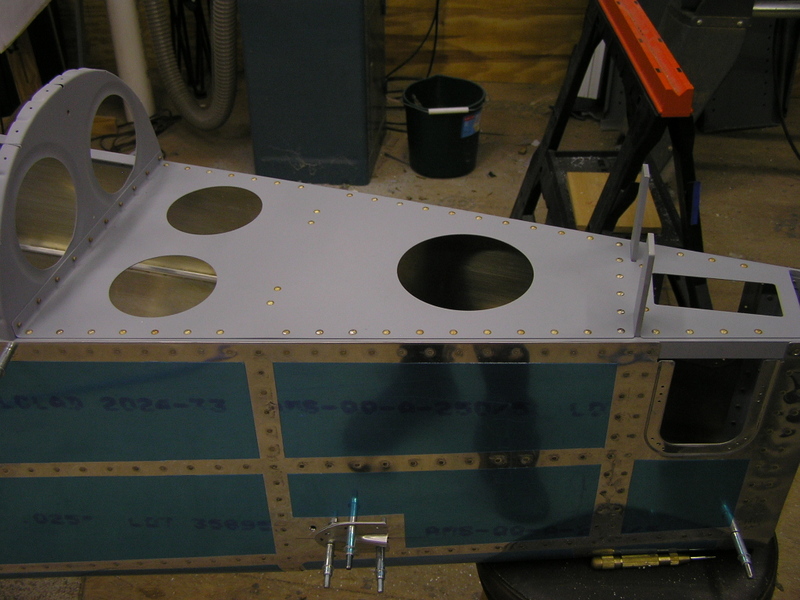 I then installed the step/block assembly to the fuselage and carefully back-drilled to the side skin using the step flange as a guide. 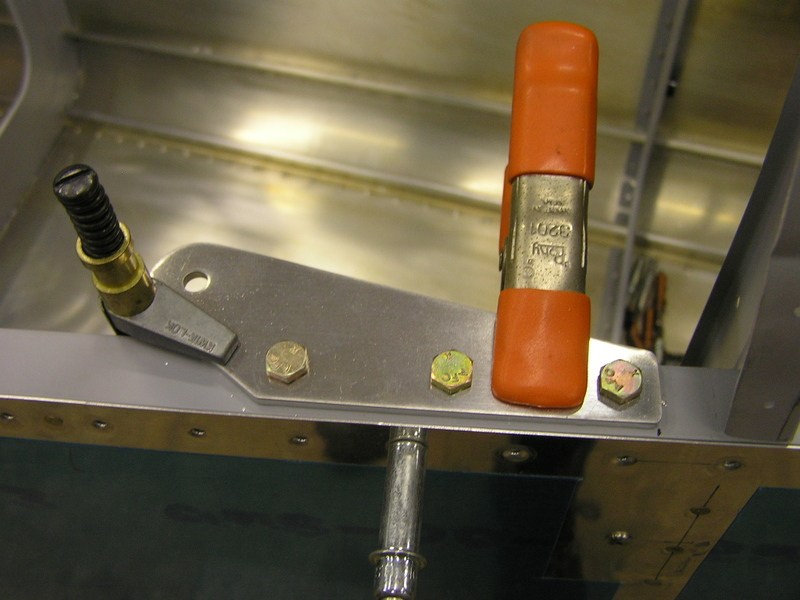 After clecoing the step to the side skin I back-drilled the phenolic block to the baggage floor rib using the Dremel tool with a 90º adapter to #30. I also drilled through the step tube using the block as a guide. After disassembly I drilled the #30 holes to #11. Since the steps are going to get a lot of abuse I decided to install a back plate behind the skin for additional support. I used some scrap .032 and cut a piece about 2.75" x 3.00". I trimmed for the step tube and deburred. 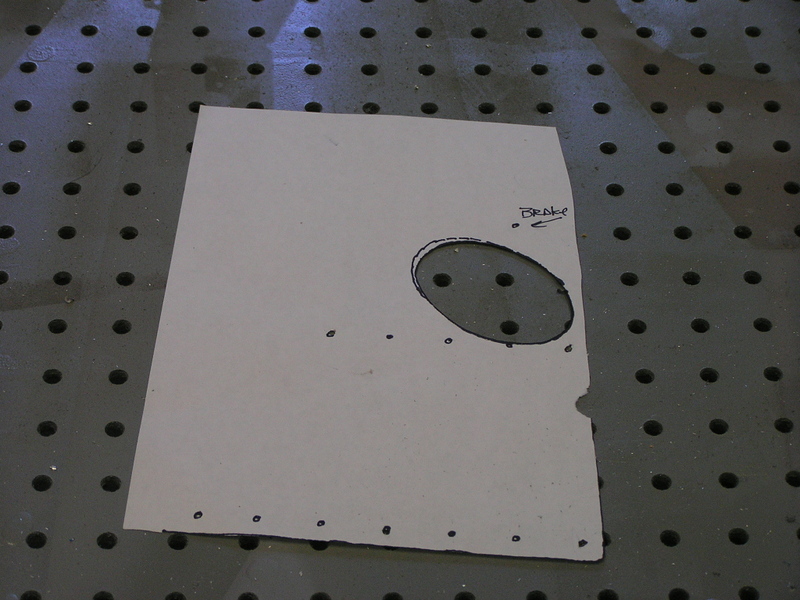 Next, I back-drilled using the holes in the skin as a guide. 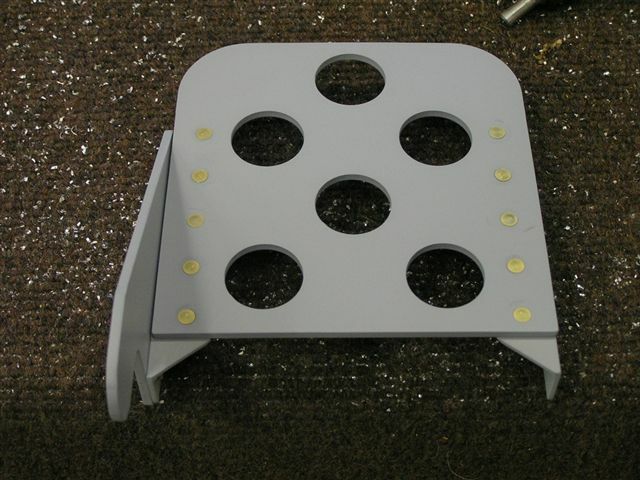 Finally, I will be installing the steps with flush rivets so I countersunk the holes in the step flange. 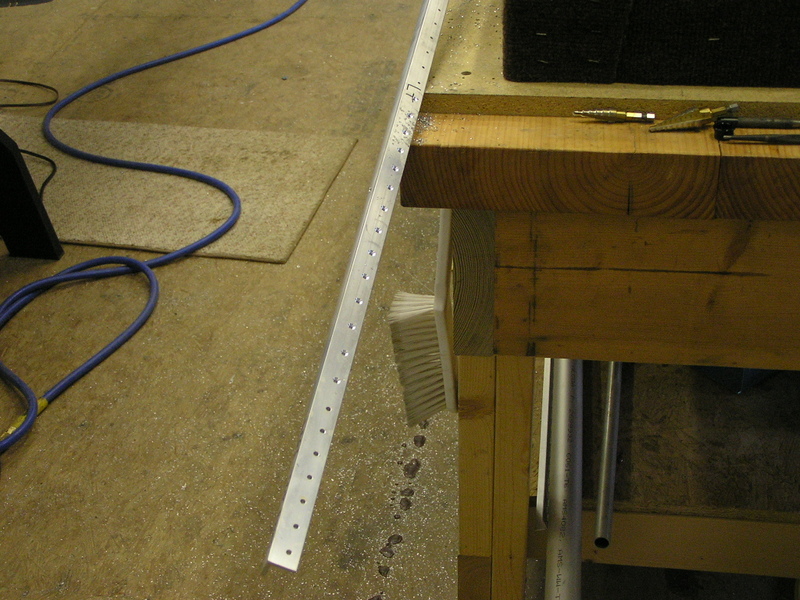 I finished by using a file to bevel the edges of the step flange. I am spending a lot of time on the steps to make them as nice as possible as this is one item on the plane that will get a lot of abuse and is one of the main things people will look at. 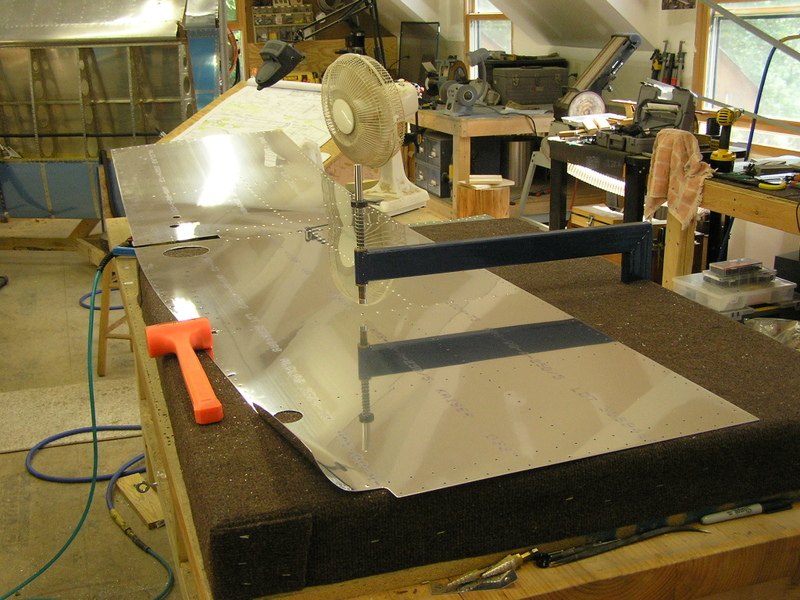 When I finally install the steps I will use ProSeal behind the flange before riveting to ensure a weather-tight seal with the fuselage. One down, one to go! 8/25/07 Today I installed the right step. The process was almost identical to the left step. Afterward, I washed and scuffed the steps and etch primed. I initially planned to install the baggage floors with nutplates to allow me to remove them for inspection but have decided to follow the plans and move on. I will have to wrap the steps with a towel. Otherwise, I will be banging my shins on them from now on. 9/1/07 Taped off the area around the step flanges. I'm concerned about water penetration behind the step flanges so I am applying a bead of ProSeal around the edges of the flanges. 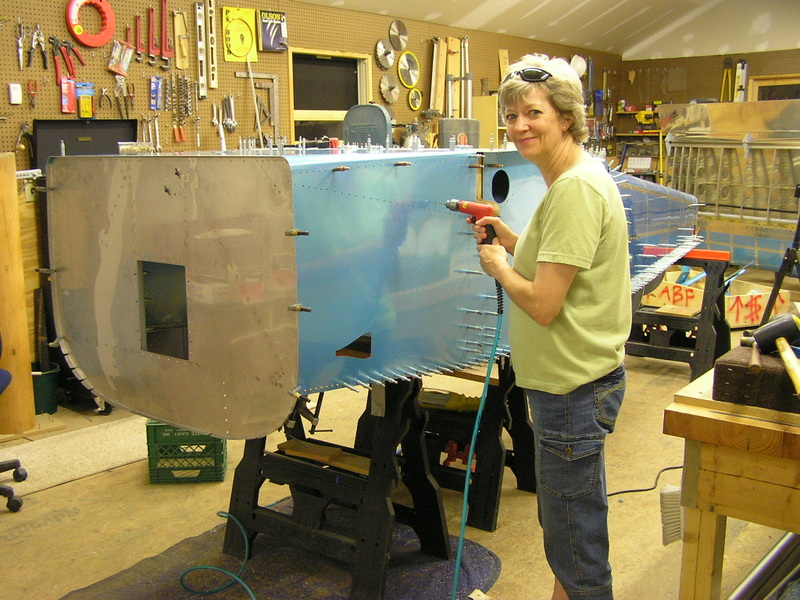 I got Lynne to help with the riveting. 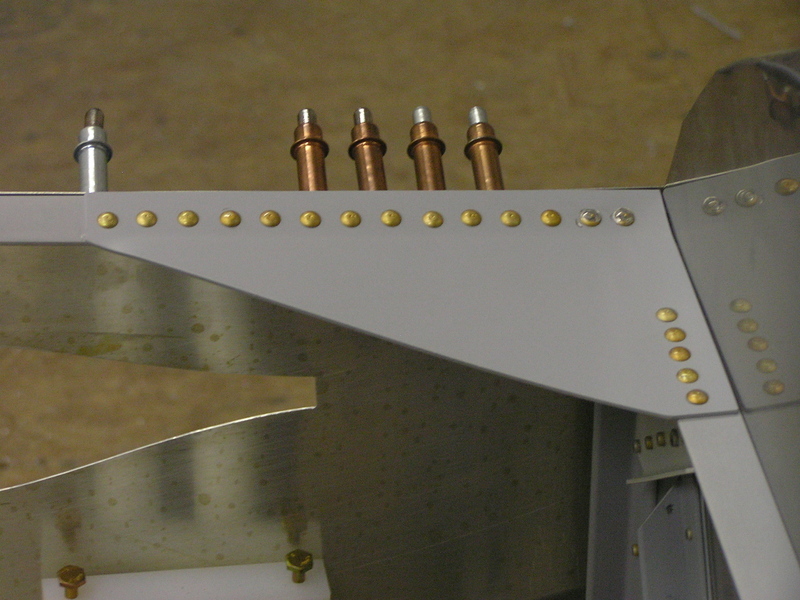 I back-riveted as many rivets as I could then switched to the flush rivet set for the rest. Finally, I bolted the steps to the baggage rib and torqued. 8/26/07 I have several small tasks to complete before moving on. Several weeks ago I purchased the crotch strap attachment from Vans so now is a good time to install before closing things up. The toughest thing about installing these things is locating them exactly where they are supposed to go. 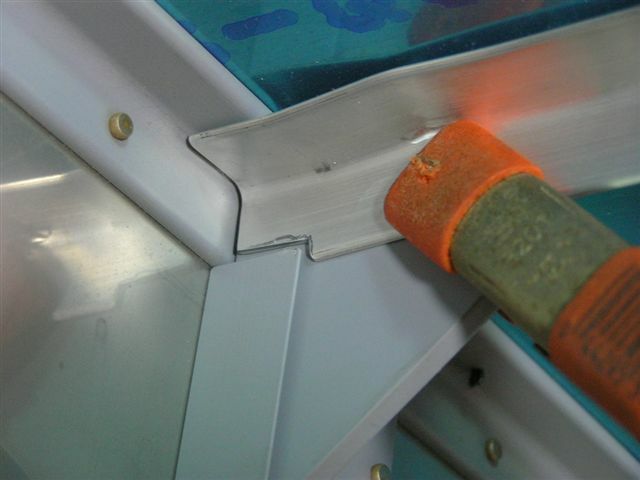 The area between the floor ribs is too tight for a drill so I used my Dremel with the 90º attachment. After fitting and drilling, I removed the plates, deburred and drilled and attached the platenuts. After scuffing and alodining I installed with blind rivets.